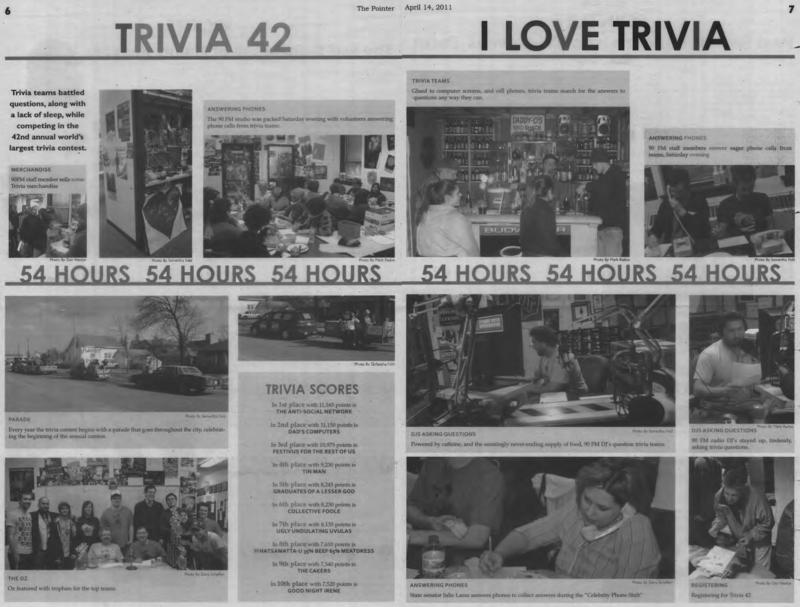 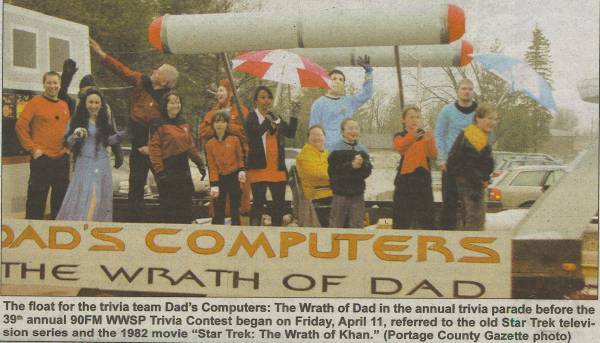 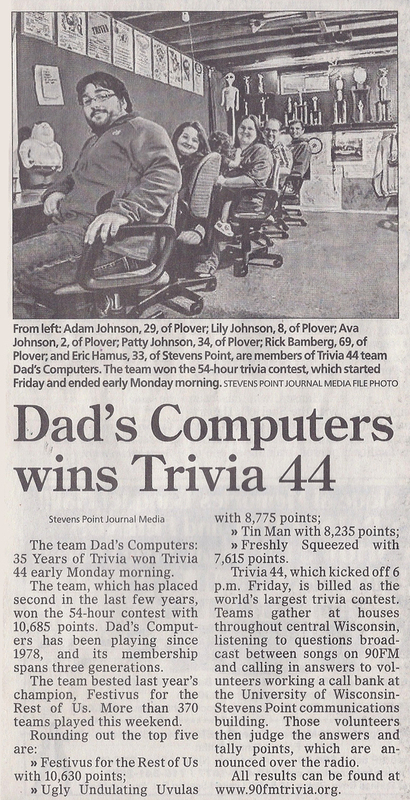 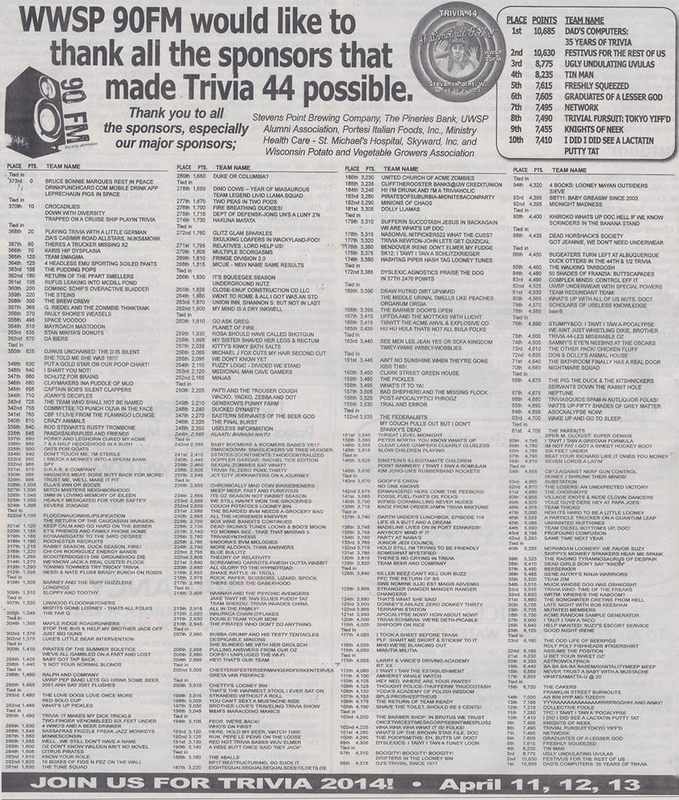 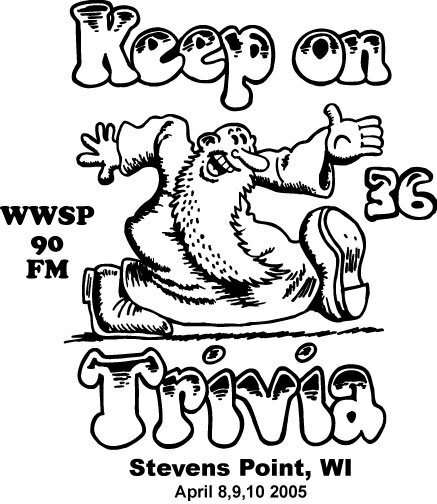 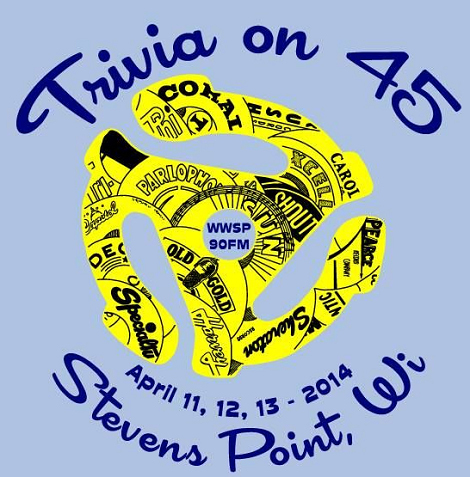 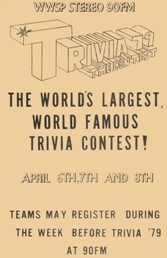 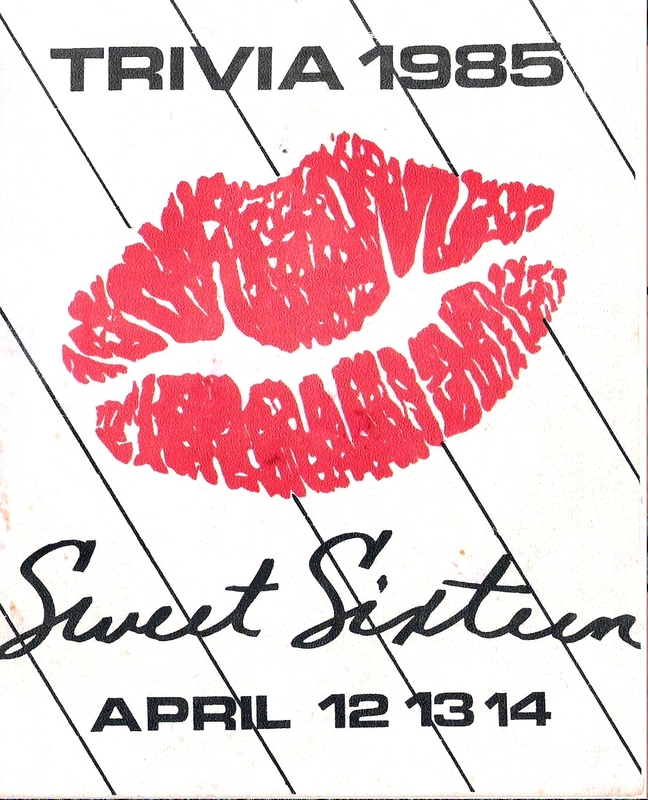 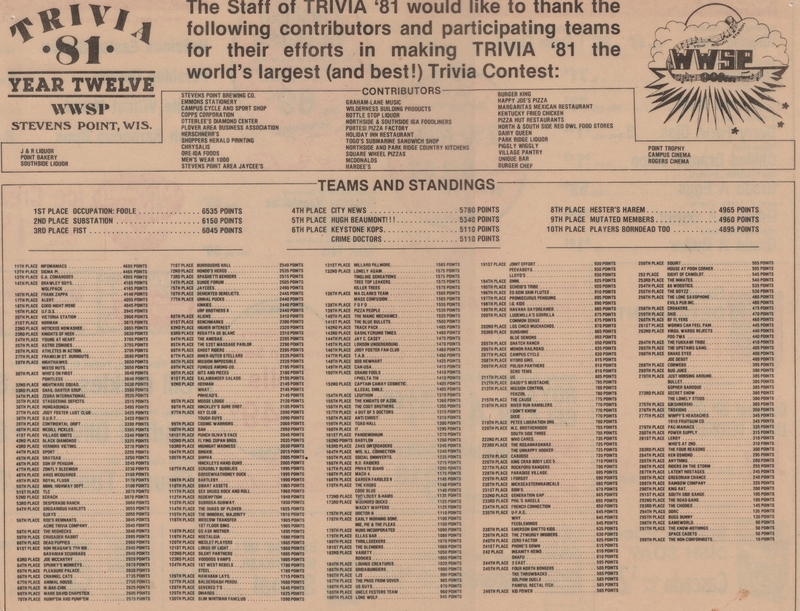 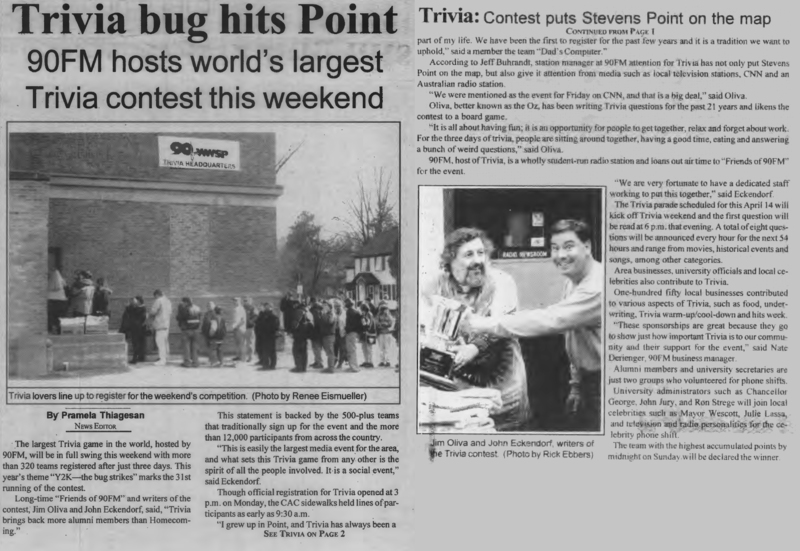 Portage County Gazette - March 21, 2019 - "Trivia Weekend Surfs into 50th Year"
Portage County Gazette - March 27, 2019 - "Trivia Spotlight: Festivus for the Rest of Us"
WSAW - December 2, 2017 - "Theme Picked For Trivia 49 in Stevens Point"
Portage County Gazette - March 30, 2018 - "Trivia 49 Opens with Movie April 6, Questions April 13-15"
Point/Plover Metro Wire - "March 1, 2018 - "UWSP prepares for 49th year of the World's Largest Trivia Contest'"
Stevens Point Journal - April 11, 2018 - "Spend a trivia-filled weekend with WWSP 90FM in Stevens Point"
Portage County Gazette - April 13, 2018 - "Annual Trivia Contest Strikes in Area Neighborhoods"
Stevens Point Journal - April 16, 2018 - "Snowstorm, cheater can't slow down WWSP 90FM Trivia in Stevens Point"
Portage County Gazette - April 13, 2017 "UWSP To Launch Royalty of Trivia Contests"
Stevens Point Journal - April 17, 2017 - "Trivia Weekend Kicks off At WWSP 90FM"
Stevens Point Journal - April 16, 2017 - "Trivia 48 Descends on Stevens Point"
The Pointer - April 18, 2017 - "90FM Trivia Contest 2017"
Stevens Point Journal - April 21, 2017 - "Parade Kicksoff Trivia 48 Weekend at UWSP"
WAOW - April 21, 2017 - "Trivia 48 Underway in Stevens Point"
WSAW - April 23, 2017 - "Trivia 48 Wraps Up a Weekend of Questions and Answers"
WSAU - April 24, 2017 - "Festivus Wins Trivia Contest Again"
Stevens Point Journal - April 24, 2017 - "Festivus repeats as Trivia champions"
Portage County Gazette - May 1, 2017 - "Couple Marries on Trivia Parade Float"
Portage County Gazette - April 7, 2016 - "University, organizers gearing up for Trivia 47"
Stevens Point Journal - April 5, 2016 - "7 things to do in the Stevens Point area"
Portage County Gazette - April 6, 2016 - "University, organizers gearing up for Trivia 47"
Stevens Point Journal - February 10, 2014 - "World's largest trivia contest turns 45"
Wisconsin State Journal - April 6, 2014 - "Trivia Master Keeps the Questions Rolling In Stevens Point"
Portage County Gazette - April 10, 2014 - "Worldï¿½s largest trivia contest will start April 11"
Stevens Point Journal - April 10, 2014 - "Trivia 45 Test Teams Mettle - Our View"
Portage County Gazette - April 18, 2013 - "Dadï¿½s Computers wins second straight Trivia Contest"
Stevens Point Journal - April 21, 2013 - "Festivus Leads Trivia 44 in Final Hours"
Stevens Point Journal - April 24, 2013 - "Specatular End to Trivia 44"
Pointer Newspaper - April 19, 2012 - "Nothing Trivial/Trivia at UWSP"
Pointer Newspaper - April 26, 2012 - "Trivia Recap"
Pointer Newspaper - April 7, 2011 - "It's Trivia Time"
Pointer Newspaper - April 23, 2009 - "Trivia 40 Scores"
Pointer Newspaper - April 10, 2008 - "Preparations Underway For 90FM Trivia Weekend"
Pointer Newspaper - April 10, 2008 - "Trivia Invades UWSP"
Pointer Newspaper - April 17, 2008 - "Stevens Point Trivia Mourns Death of the Voice of Trivia"
Pointer Newspaper - April 17, 2008 - "Special Section: The Trivia Invasion"
Pointer Newspaper - April 19, 2007 - "Behind the Scenes of Trivia Returns"
Pointer Newspaper - April 6, 2006 - "37 Years Later Trivia Still Going Strong"
Pointer Newspaper - April 13, 2006 - "Bottle of Water in Hand Oz Brings Trivia Without Caffeine"
Pointer Newspaper - April 15, 2004 - "Annual Trivia Contest Gearing Up"
Pointer Newspaper - April 22, 2004 - "Trivia Weekend Completes Another Successful Year"
Pointer Newspaper - April 10, 2003 - "World's Largest Trivia Contest Returns to Point"
Pointer Newspaper - April 17, 2003 - "World's Largest Trivia Contest Survives Another Year"
Pointer Newspaper - April 18, 2002 - "Trivia In Point: Extra Trivial?" 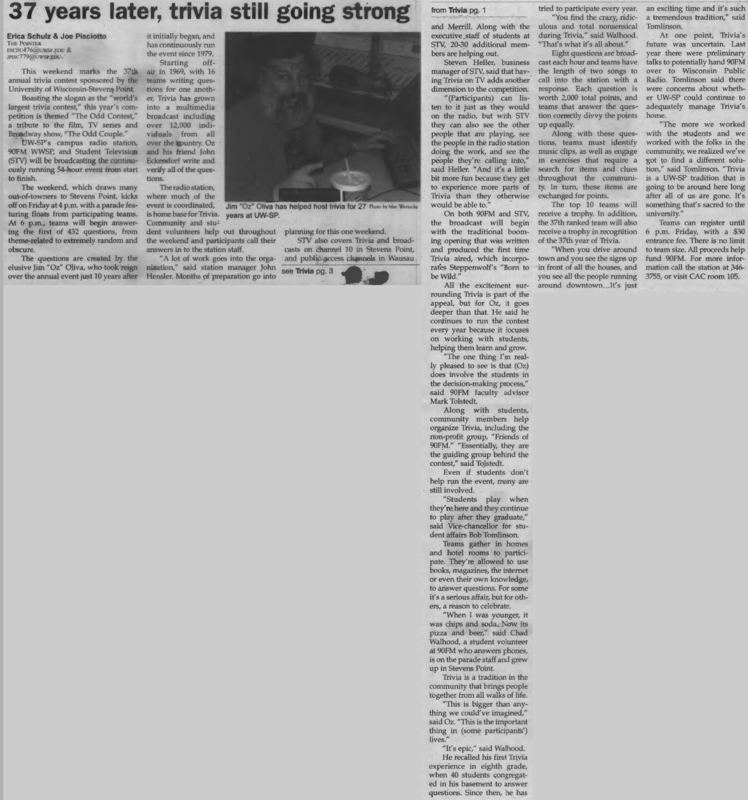 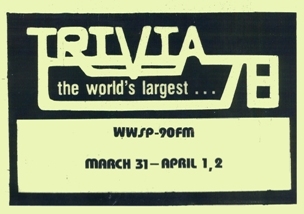 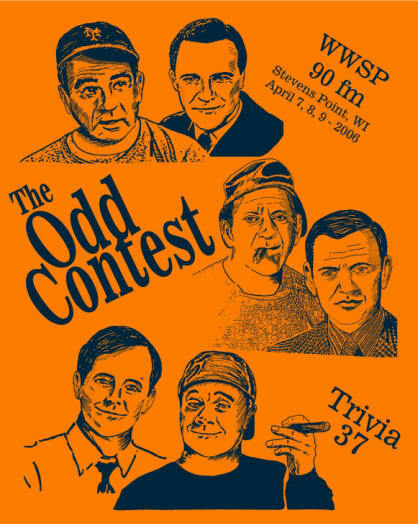 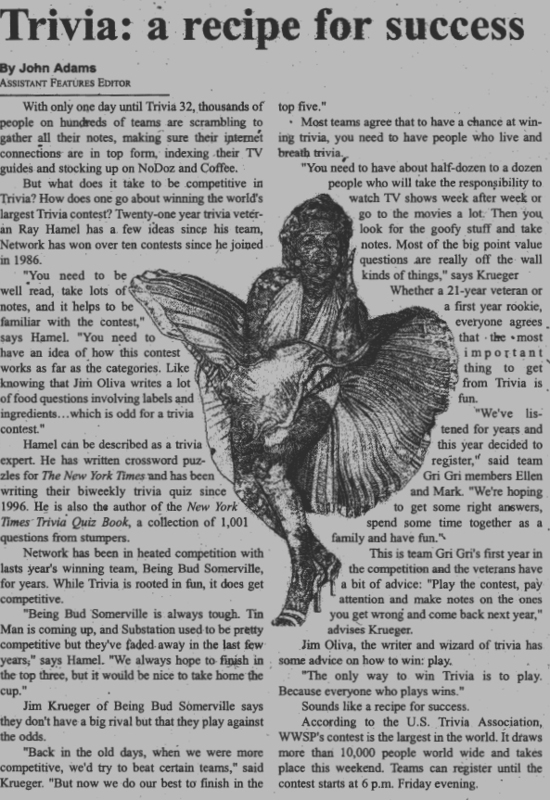 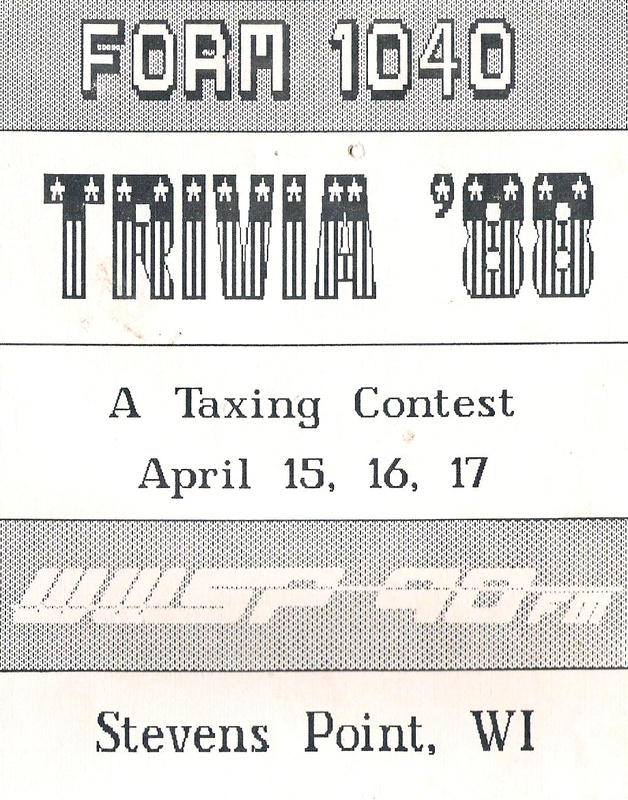 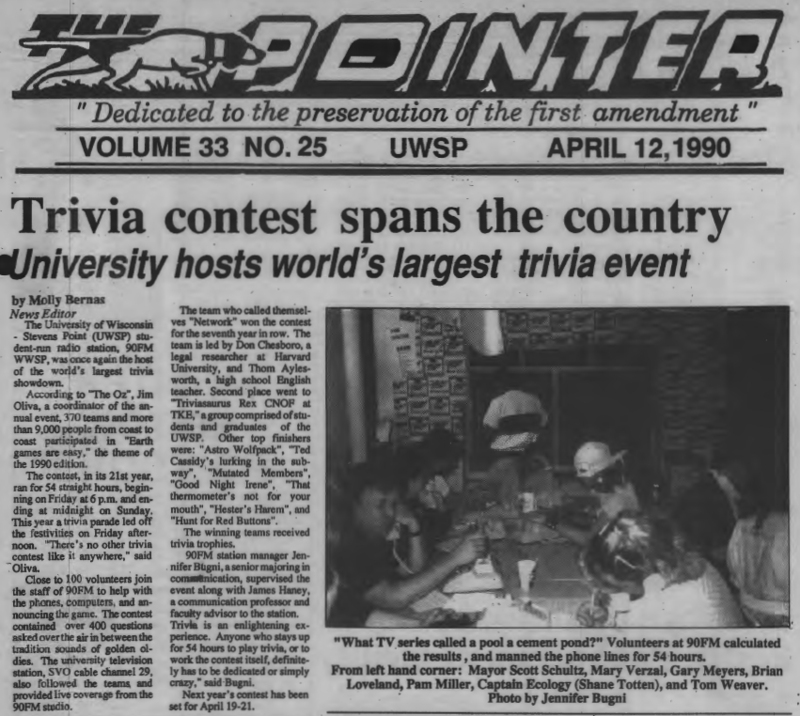 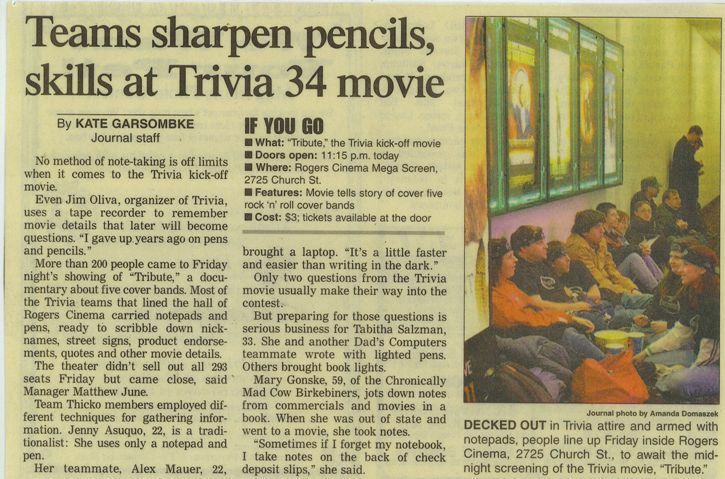 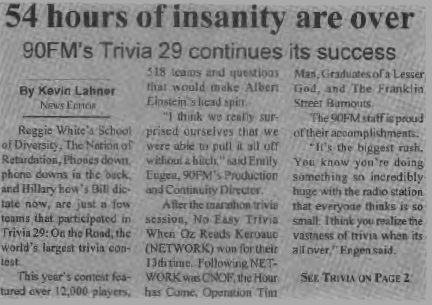 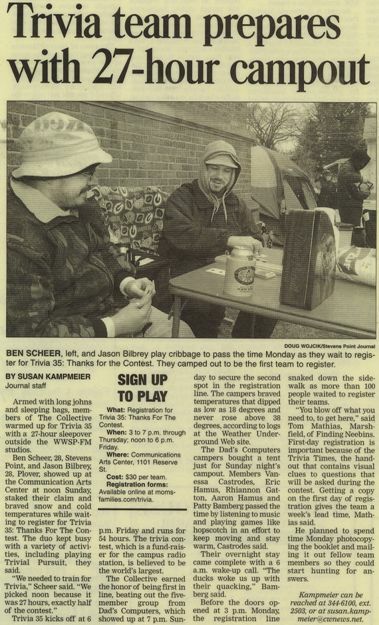 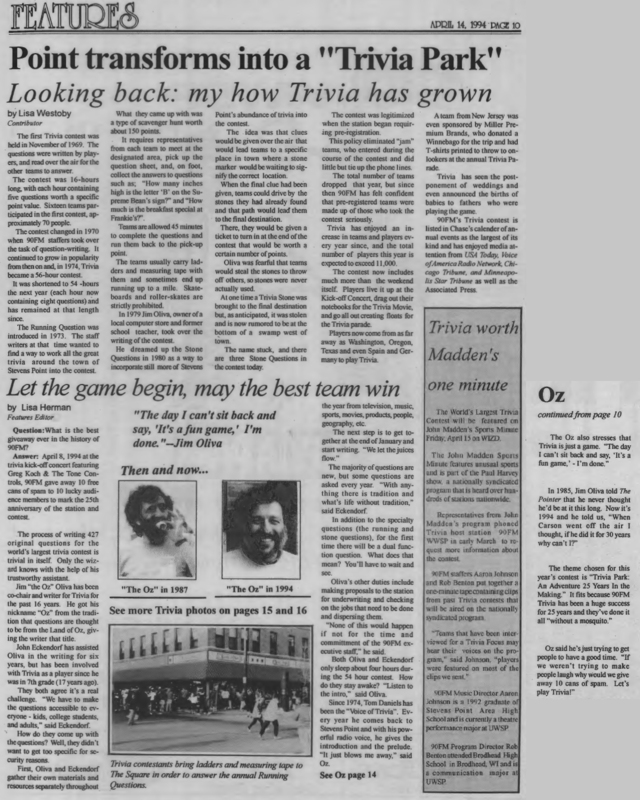 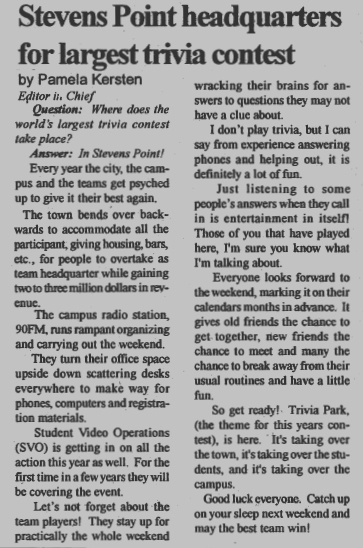 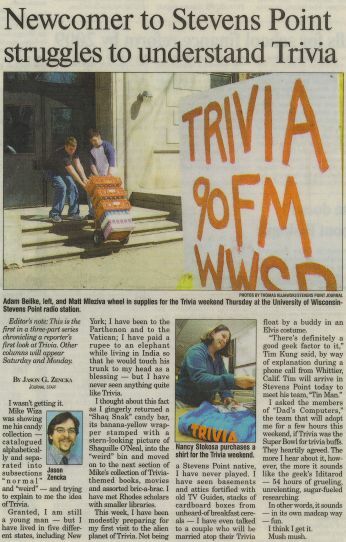 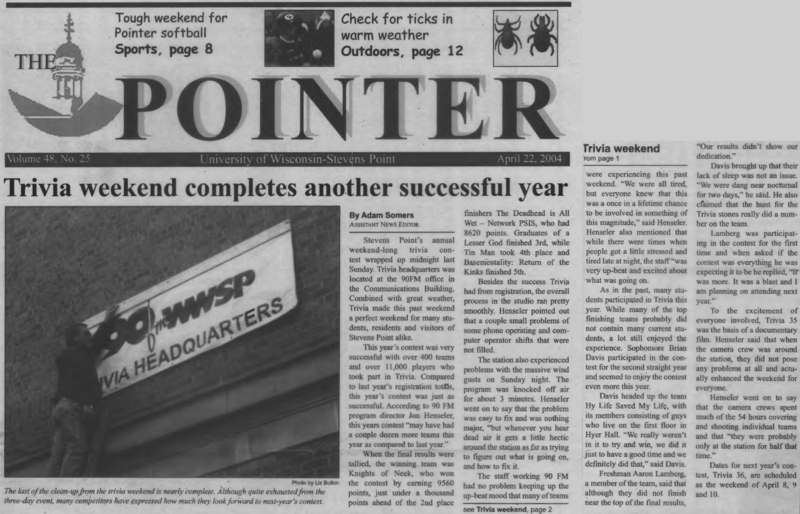 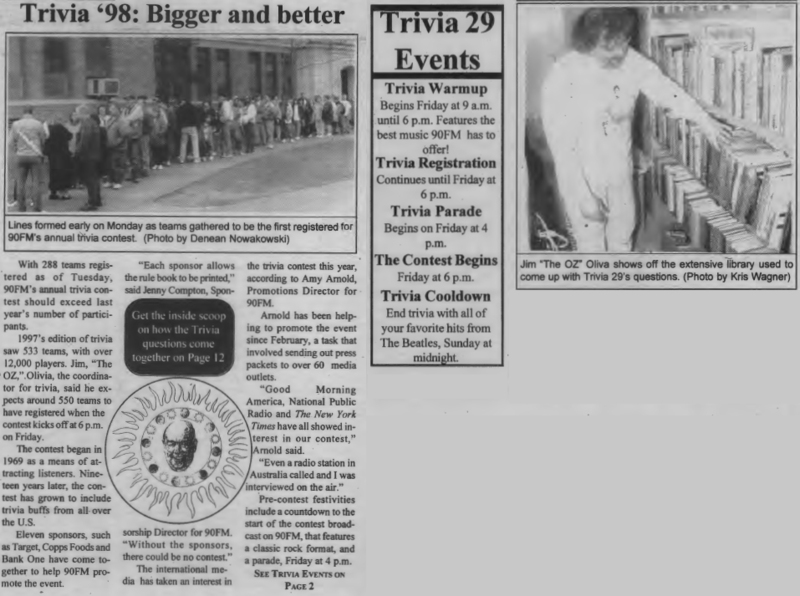 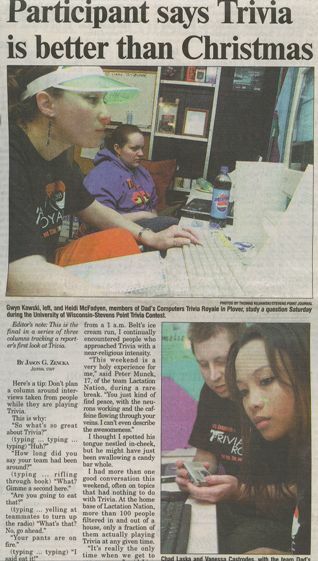 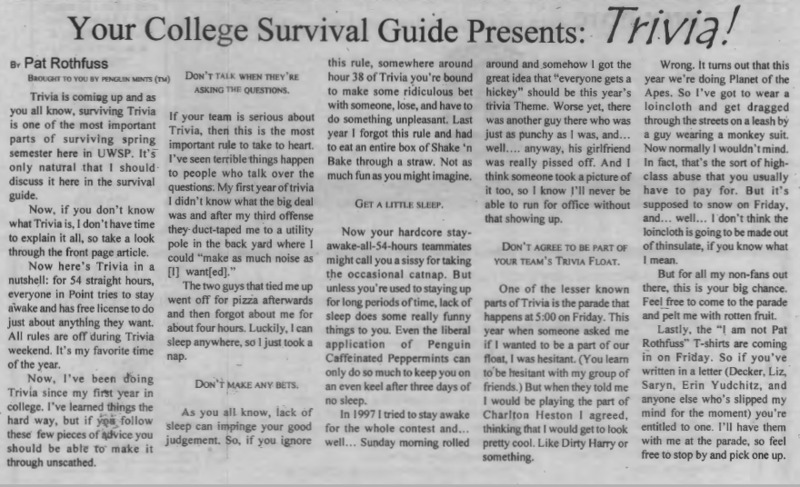 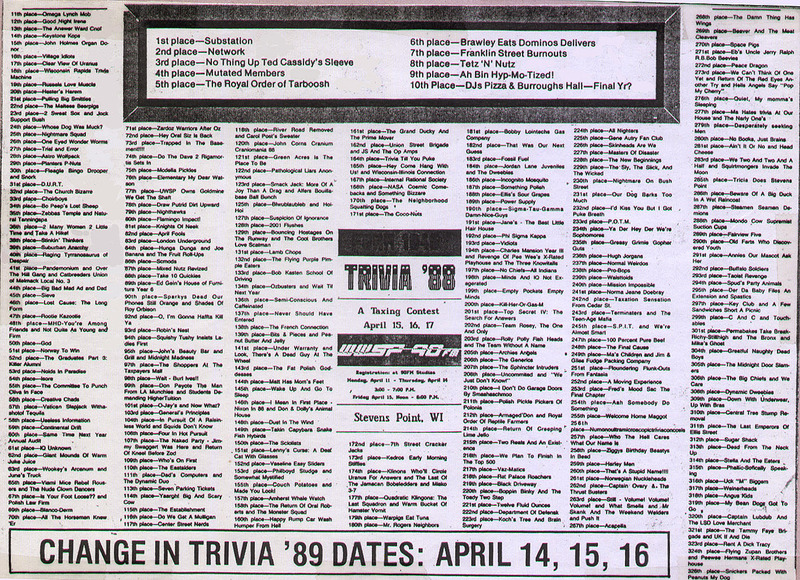 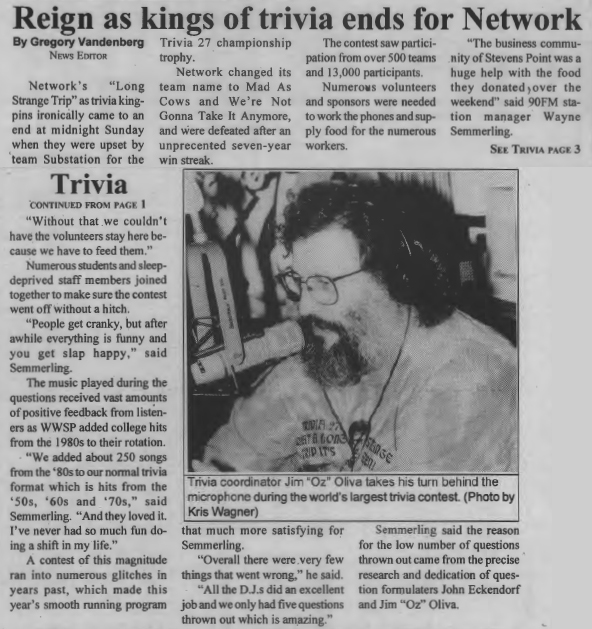 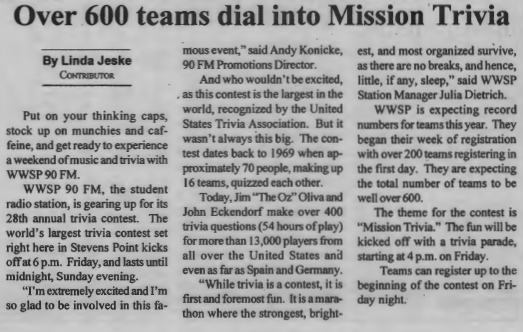 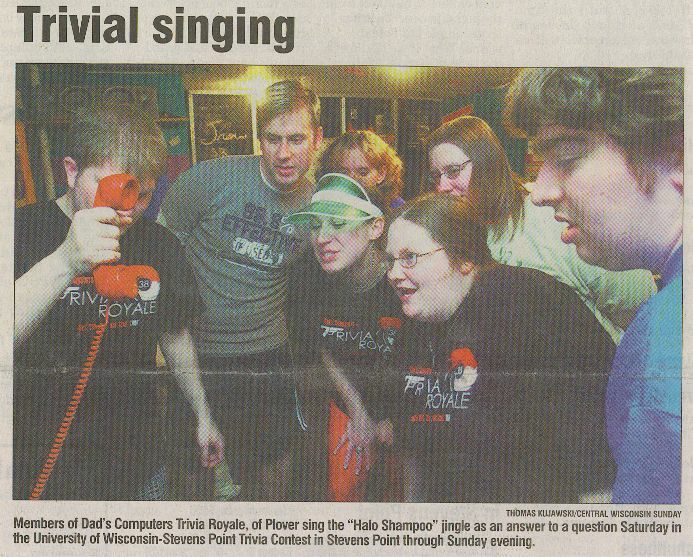 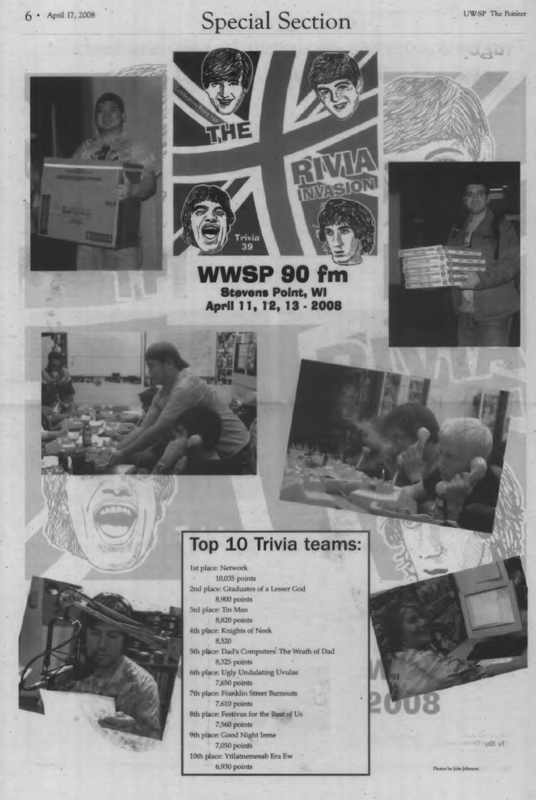 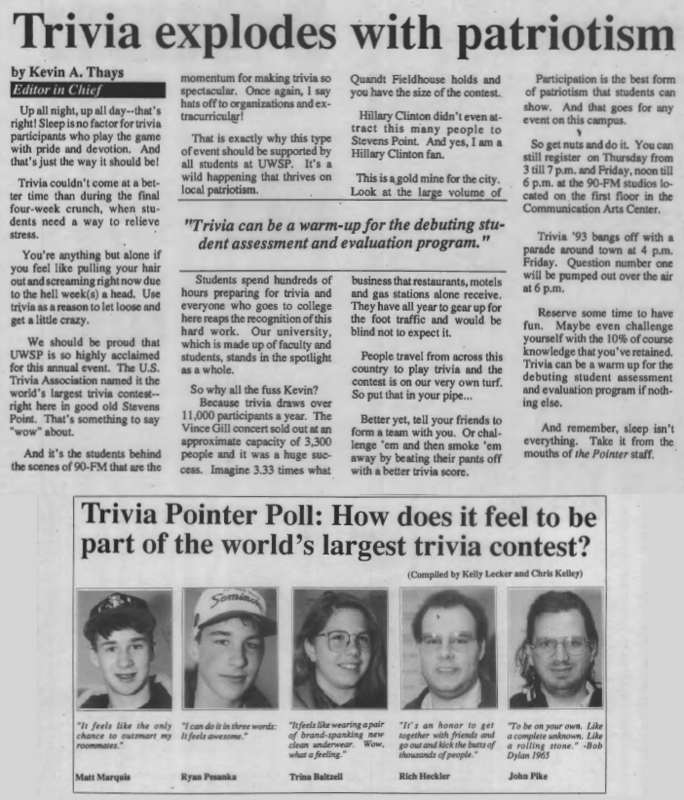 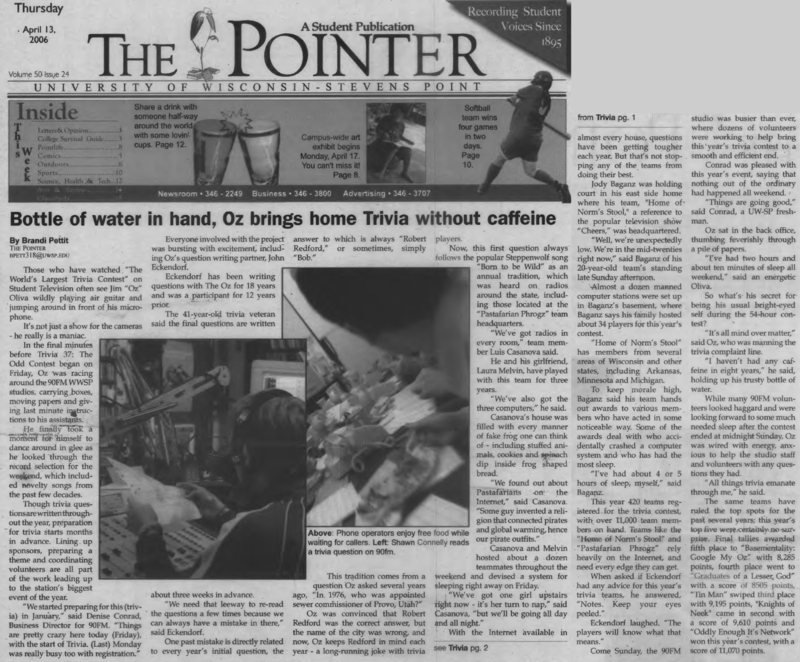 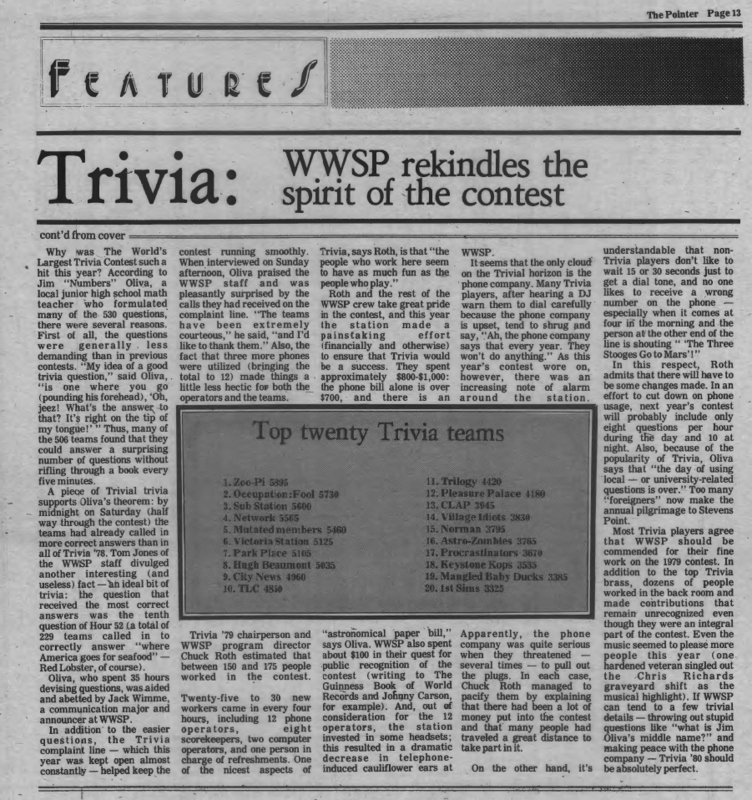 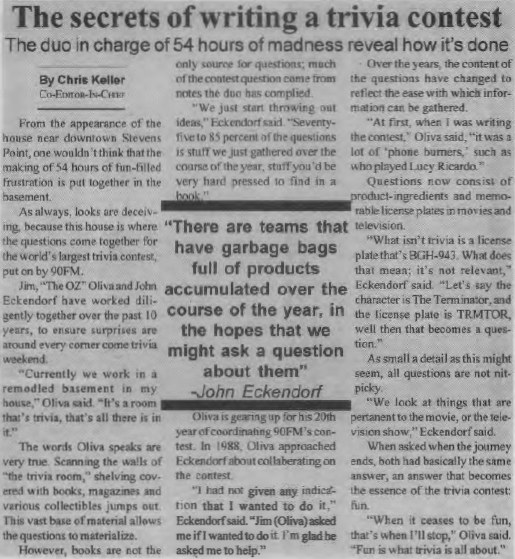 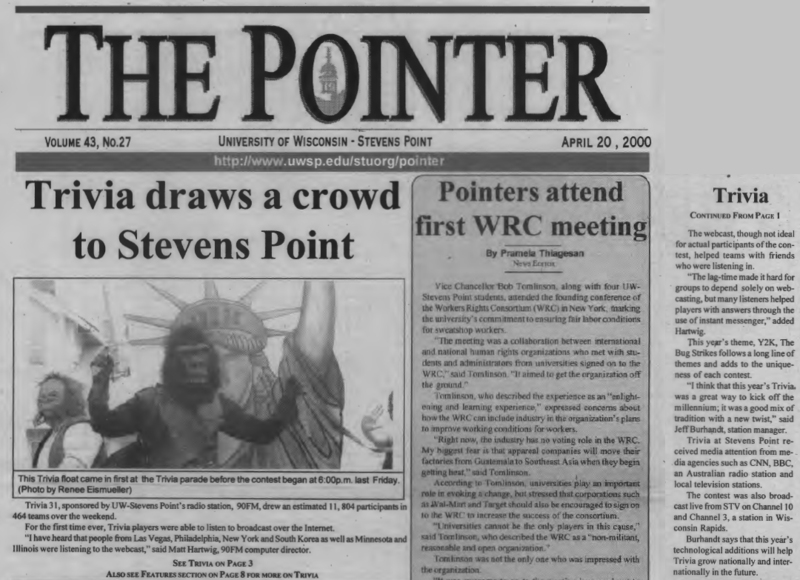 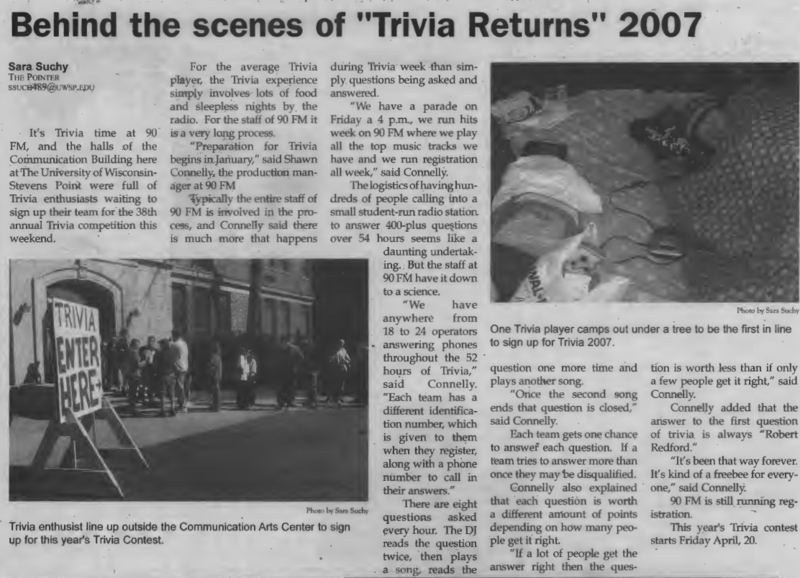 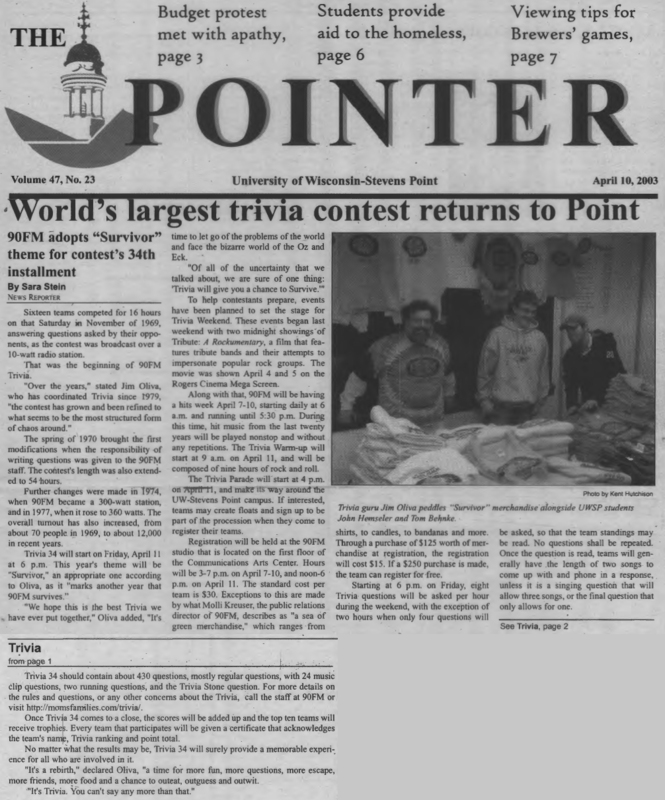 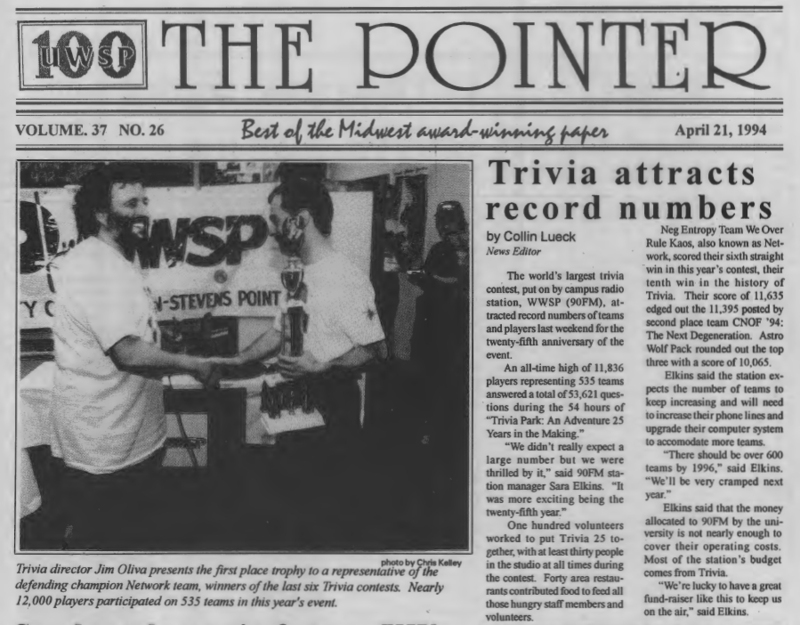 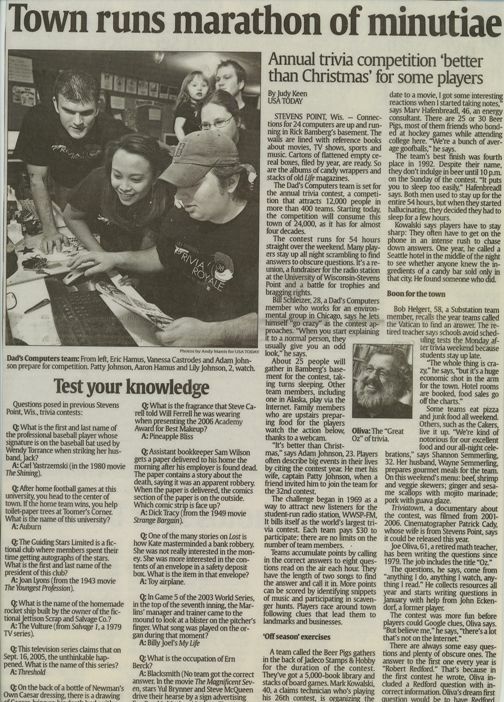 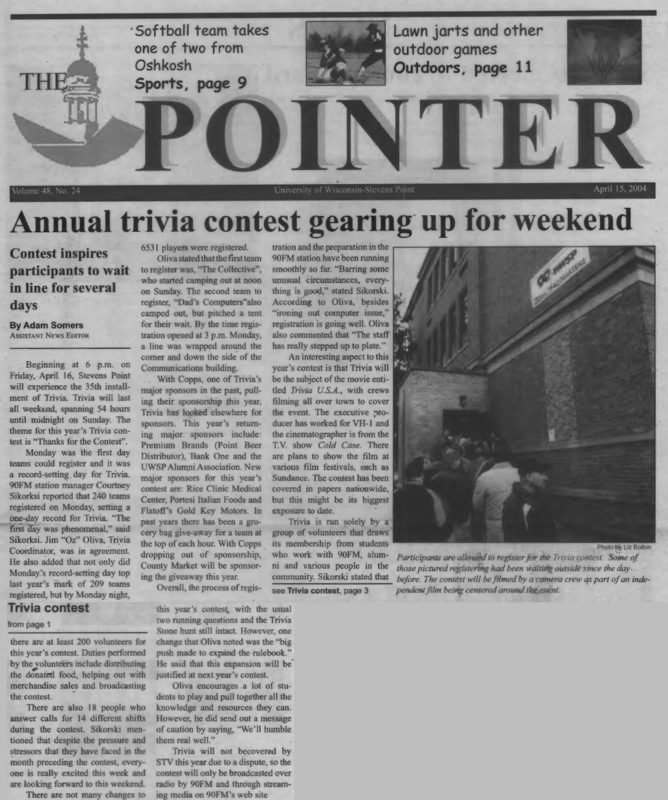 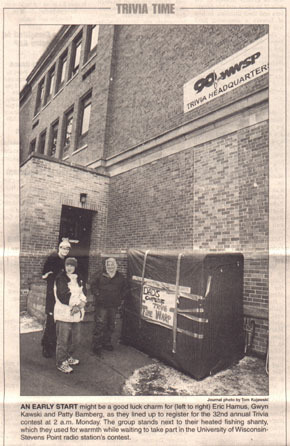 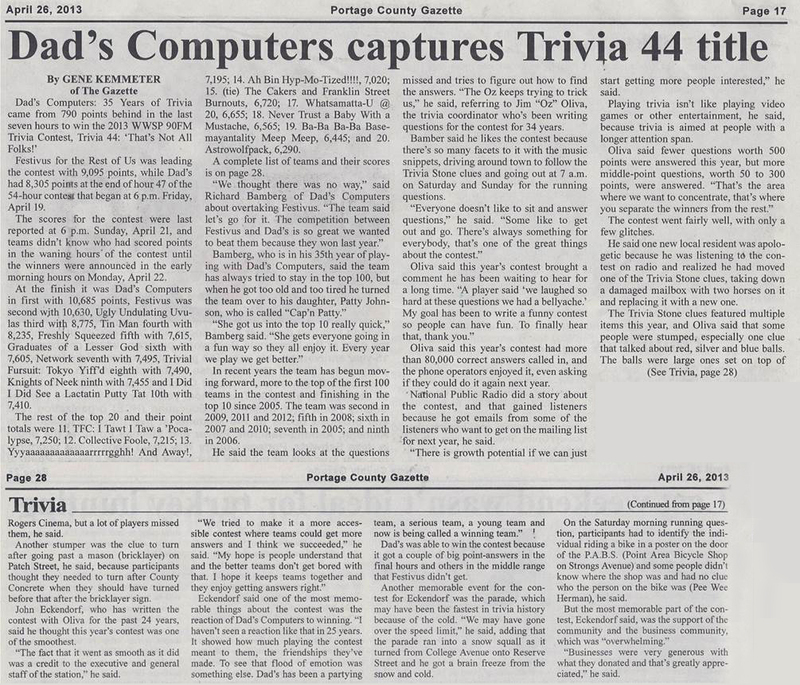 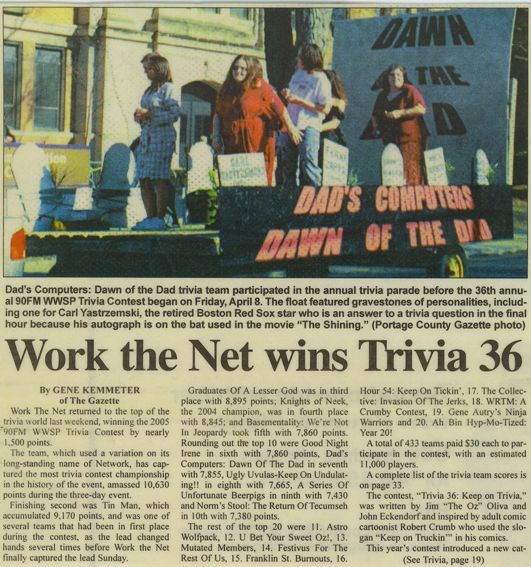 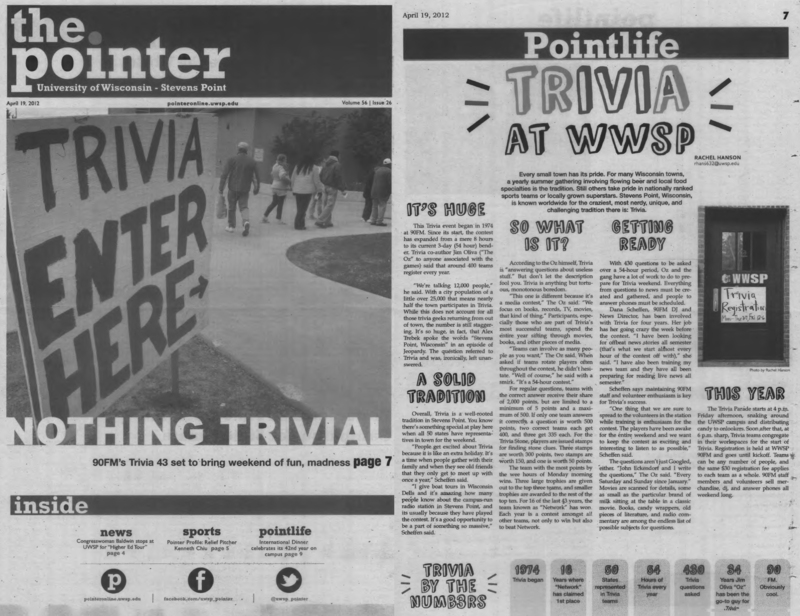 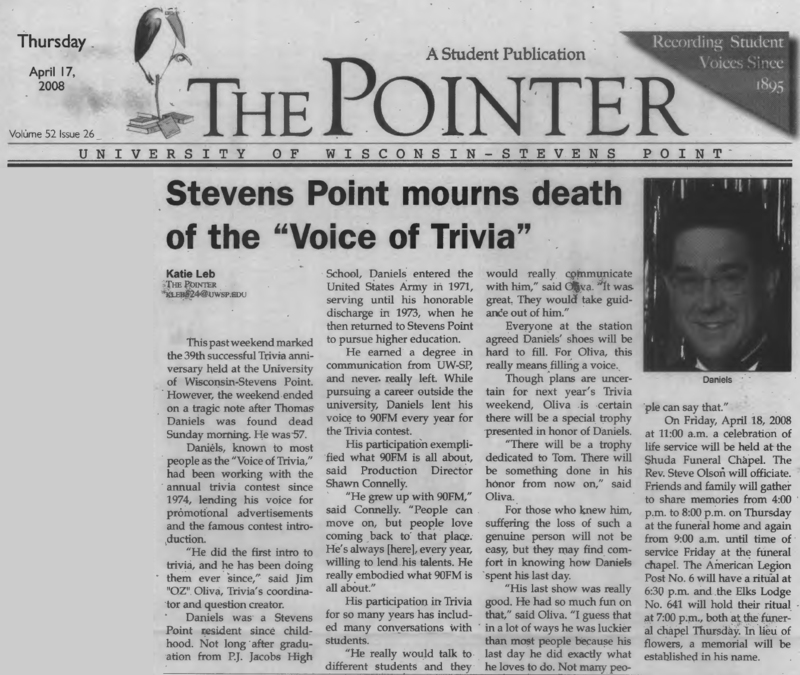 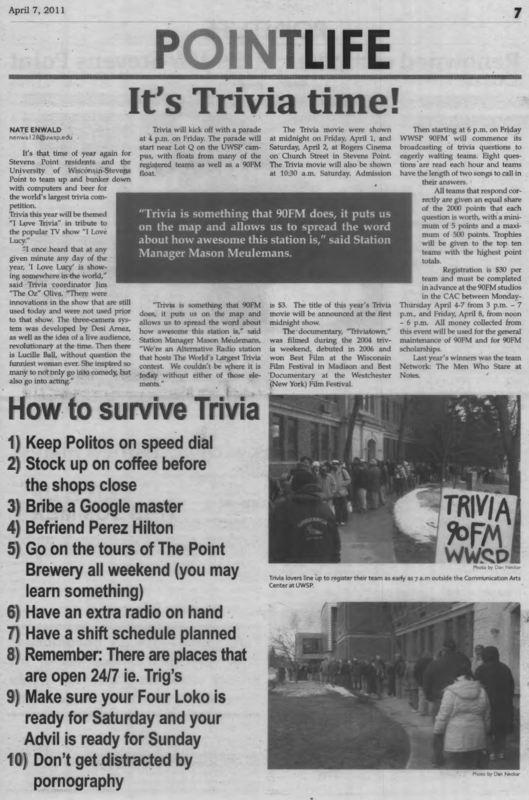 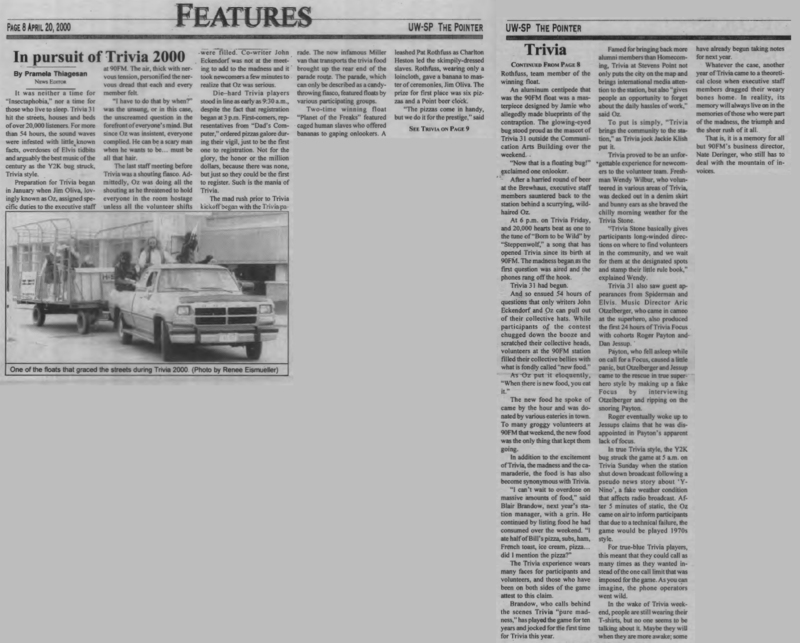 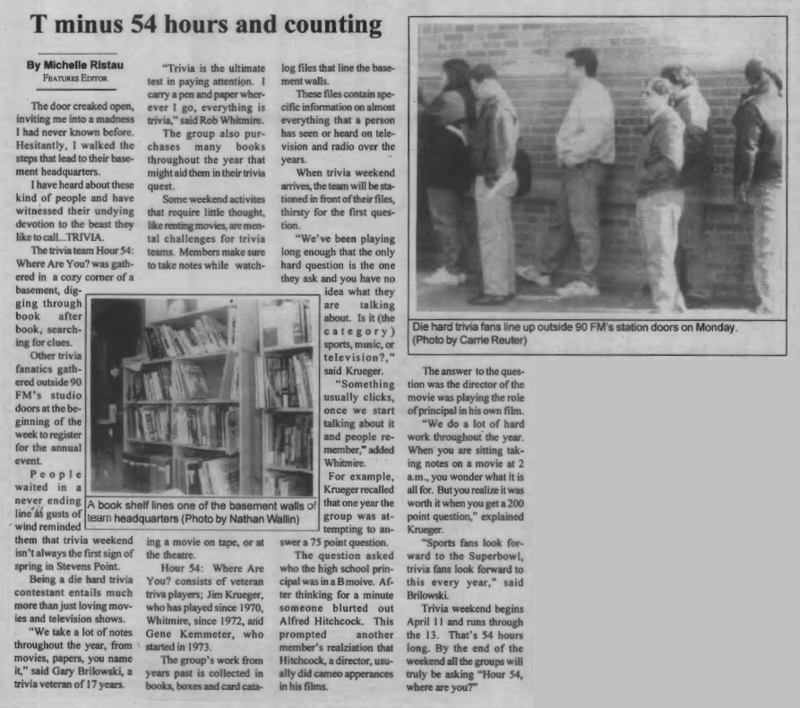 Pointer Newspaper - April 18, 2002 - "World's Largest Trivia Contest Takes Over UWSP"
Pointer Newspaper - April 25, 2002 - "All In the Contest Winners"
Pointer Newspaper - April 19, 2001 - "Trivia Recipe for Success"
Pointer Newspaper - April 13, 2000 - "Trivia Bug Hits Point"
Pointer Newspaper - April 13, 2000 - "Your College Survival Guide Presents: TRIVIA"
Pointer Newspaper - April 20, 2000 - "In Pursuit of Trivia 2000"
Pointer Newspaper - April 20, 2000 - "Trivia Draws a Crowd"
Pointer Newspaper - April 15, 1999 - "90FM Has Campus Community Ready to Trivia Like It's 1999"
Pointer Newspaper - April 22, 1999 - "A Look Behind the Scenes of Trivia 30"
Pointer Newspaper - April 22, 1999 - "CNOF54 Takes Trivia"
Pointer Newspaper - April 16, 1998 - "The Secrets of Writing A Trivia Contest"
Pointer Newspaper - April 16, 1998 - "Trivia '98 Bigger and Better"
Pointer Newspaper - April 23, 1998 - "54 Hours of Insanity Are Over"
Pointer Newspaper - April 10, 1997 - "Over 600 Teams Dial Into Mission Trivia"
Pointer Newspaper - April 10, 1997 - "T-Minus 54 Hours And Counting"
Pointer Newspaper - April 11, 1996 - "Trivia Contestants Embark on Long Strange Trip"
Pointer Newspaper - April 18, 1996 - "Reign as Kings Of Trivia Ends For Network"
Pointer Newspaper - April 13, 1995 - "90FM Contest Anything But Trivial"
Pointer Newspaper - April 14, 1994 - "25 Years of Trivia"
Pointer Newspaper - April 14, 1994 - "Point Transforms Into Trivia Park"
Pointer Newspaper - April 14, 1994 - "Stevens Point Headquarters for Worlds Largest Trivia Contest"
Pointer Newspaper - April 14, 1994 - "Trivia Celebrates Silver Anniversary"
Pointer Newspaper - April 21, 1994 - "Trivia Attracts Record Numbers"
Pointer Newspaper - April 15, 1993 - "Getting Ready: The Making of a Tradition/Trivia 1993 Promises to Be a Competitive Affair"
Pointer Newspaper - April 15, 1993 - "Past Holds Tales of Trivia Evolution / The Oz Brings Trivia To Life"
Pointer Newspaper - April 15, 1993 - "Trivia Explodes With Patriotism/Pointer Poll: How Does IT Feel to Be Part of the Worlds Largest Trivia Contest?" 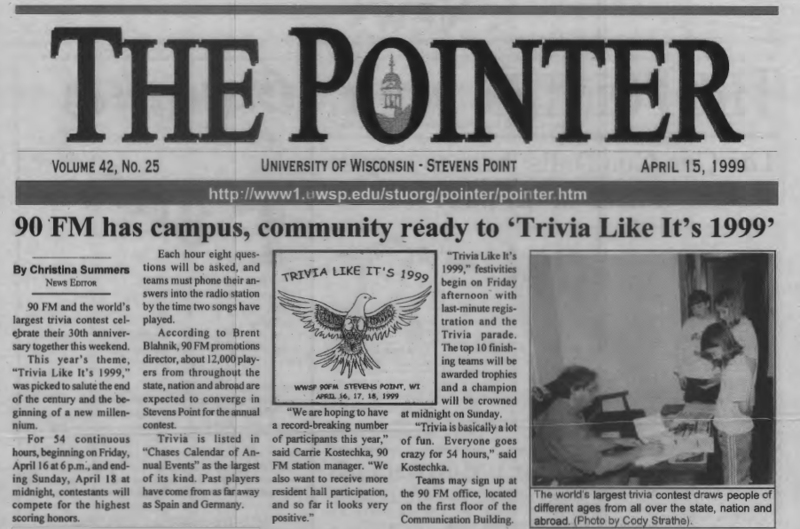 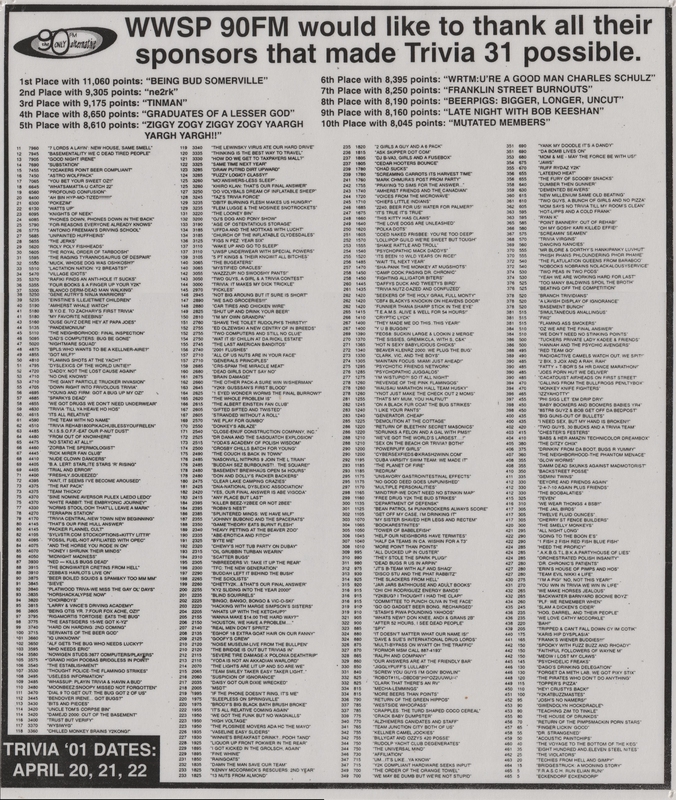 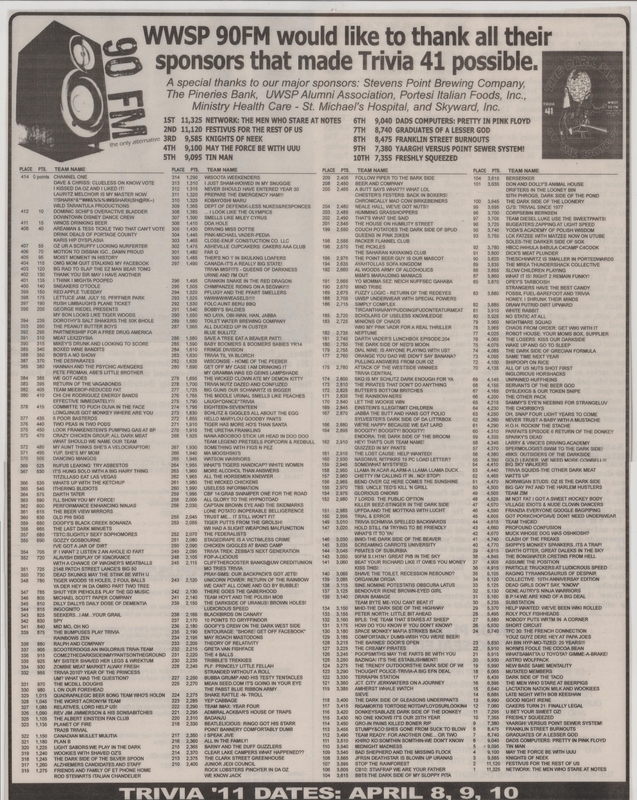 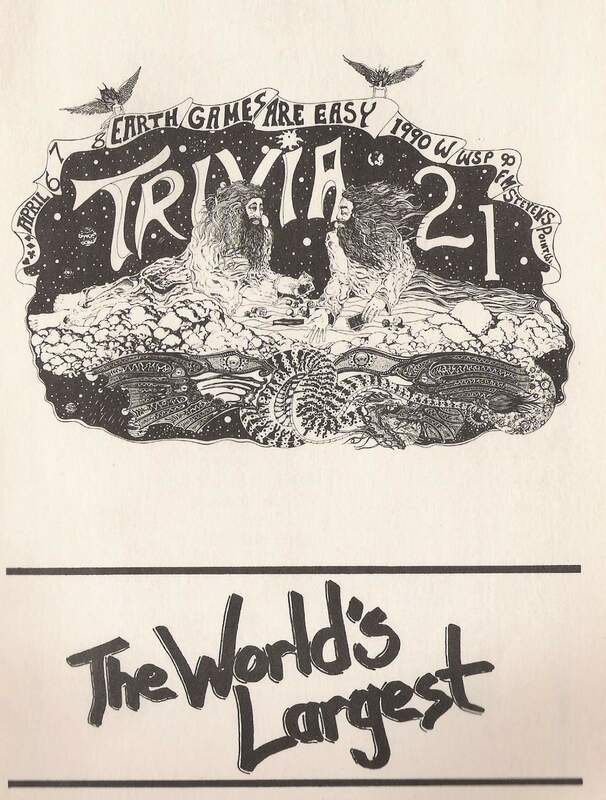 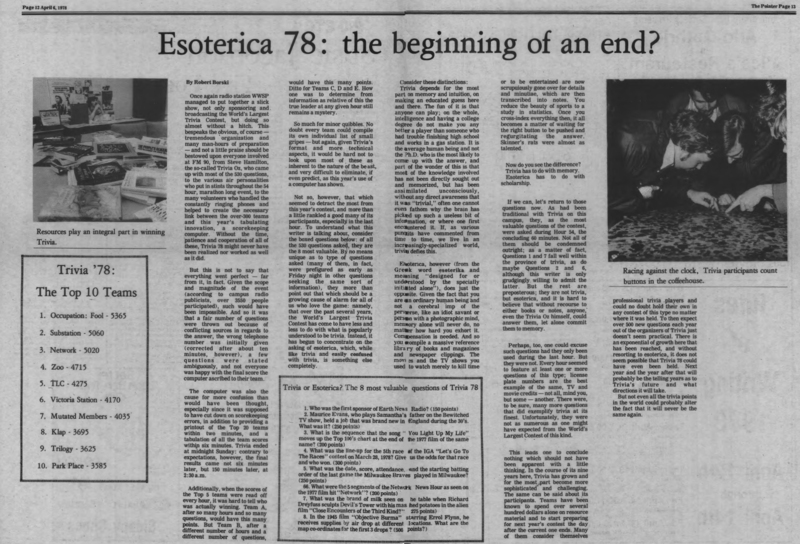 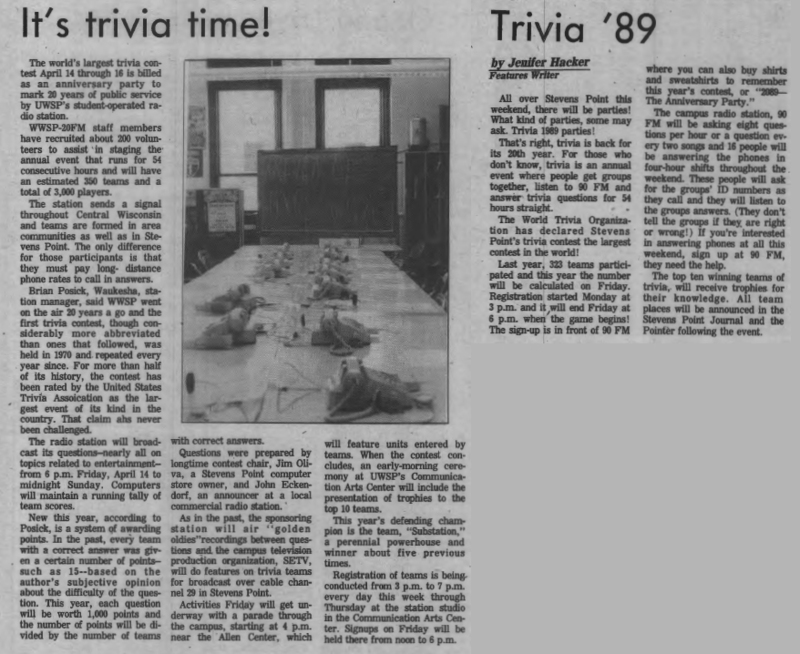 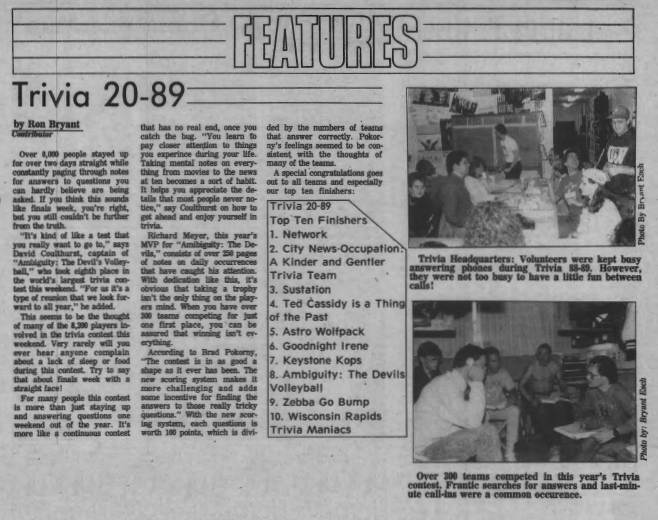 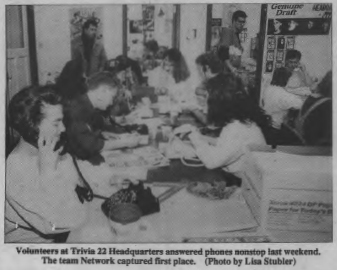 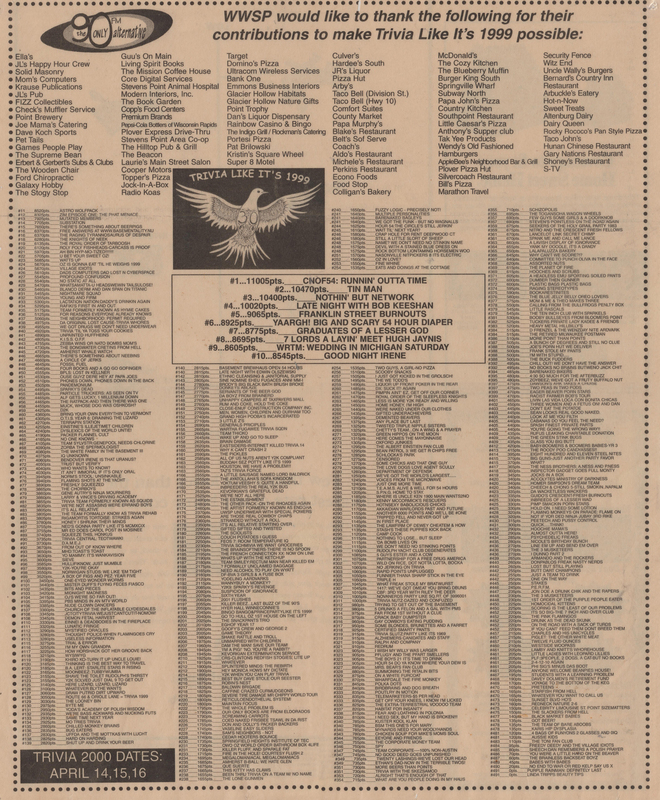 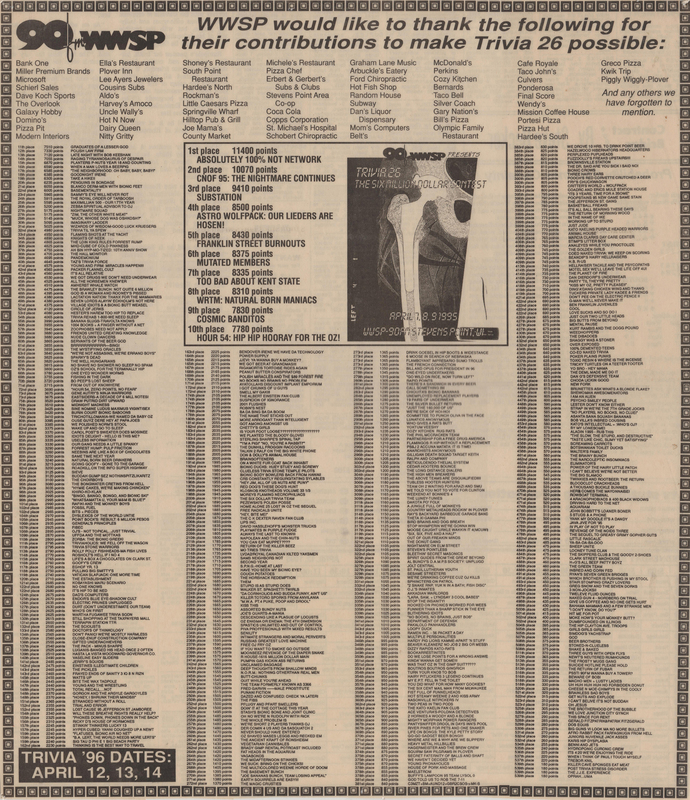 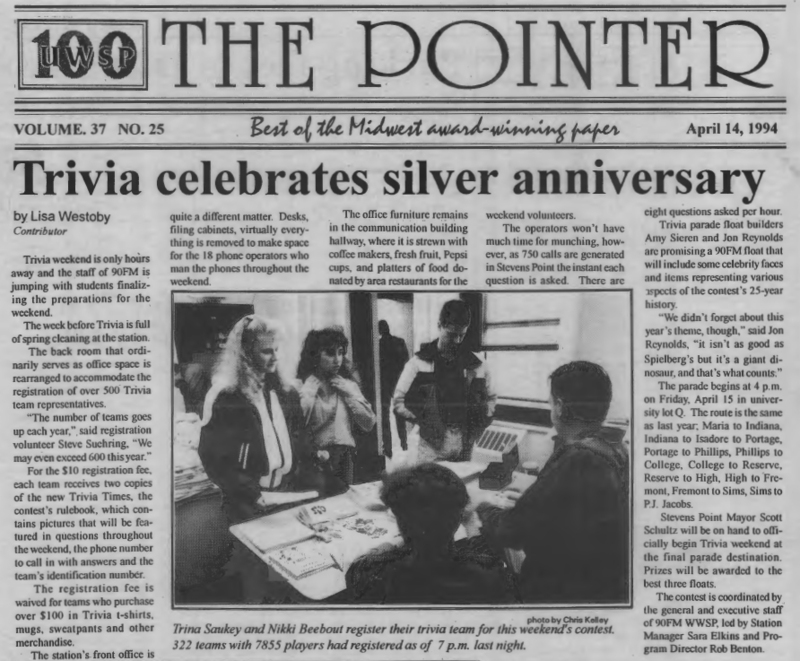 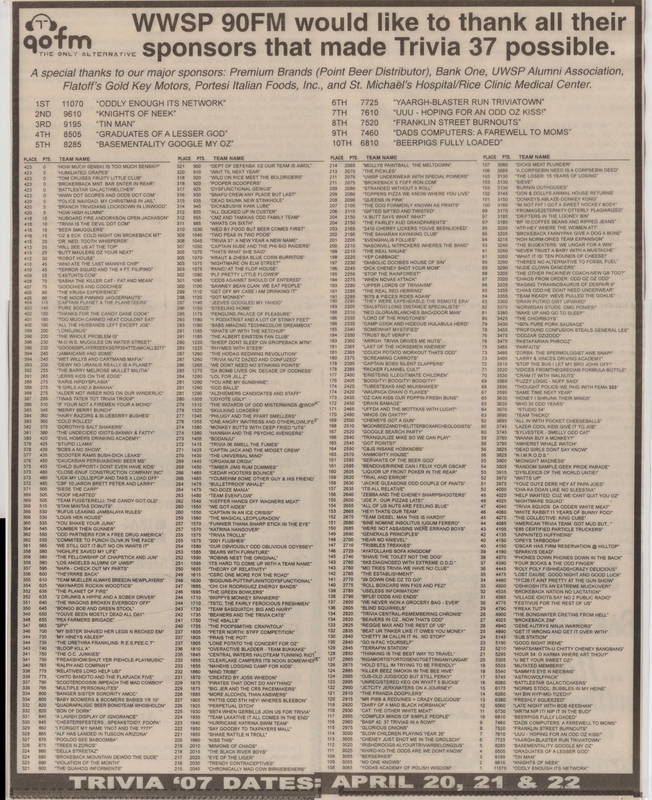 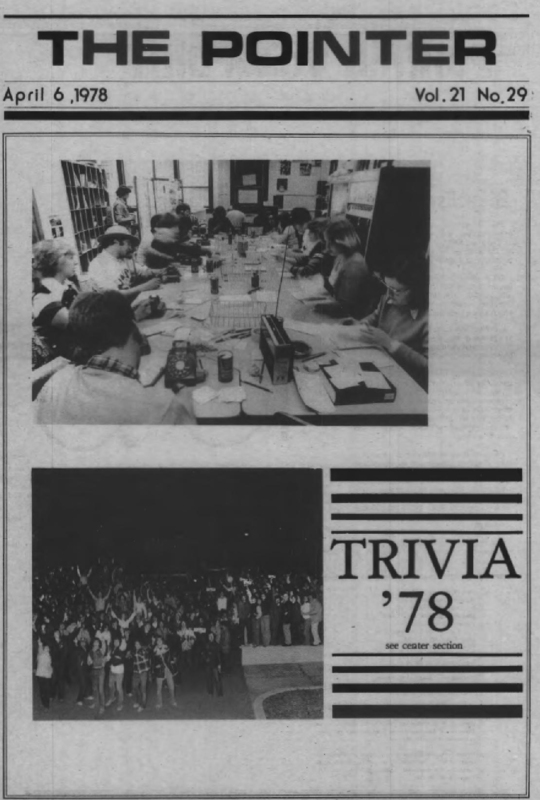 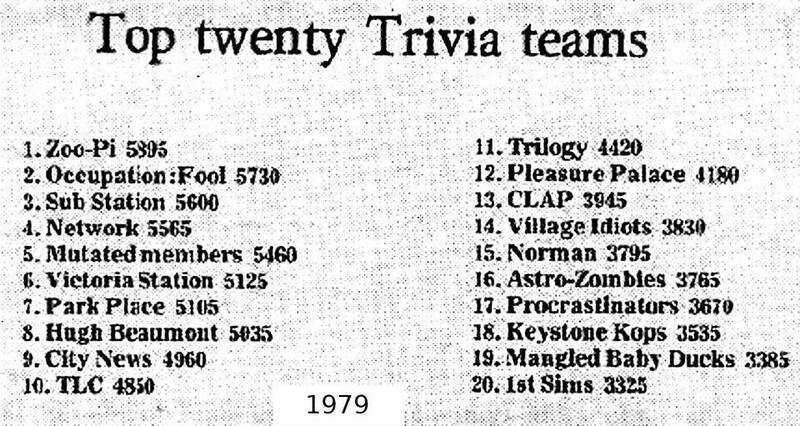 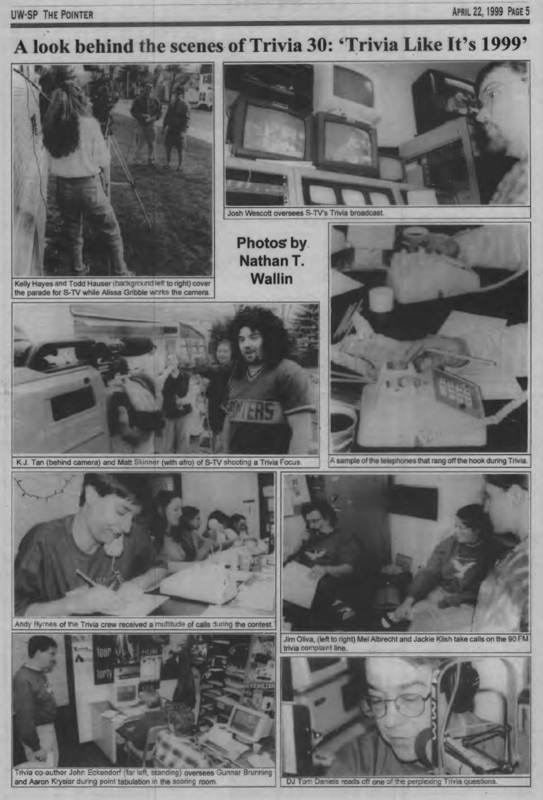 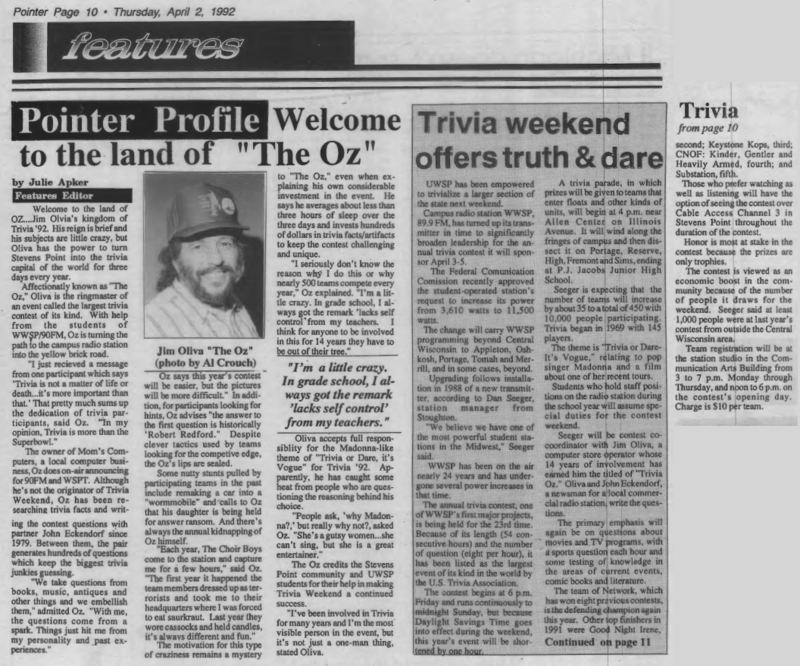 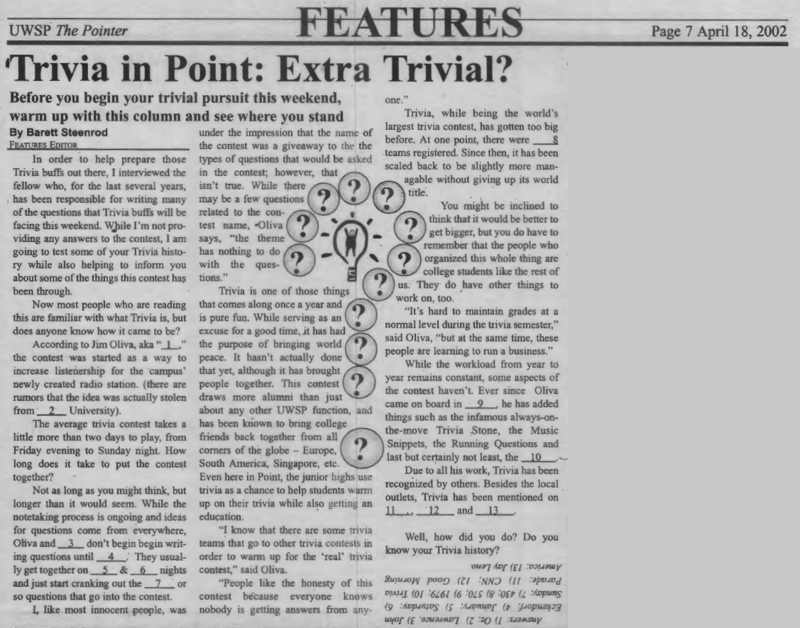 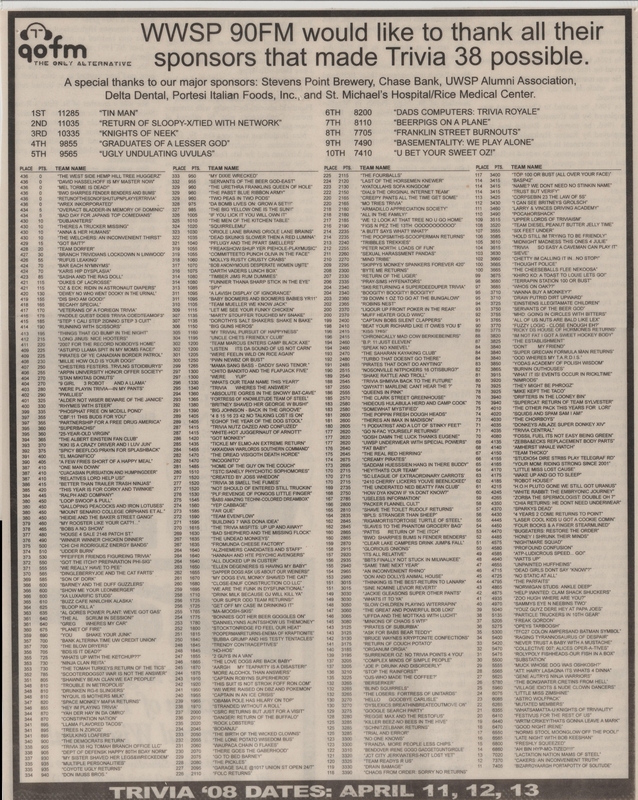 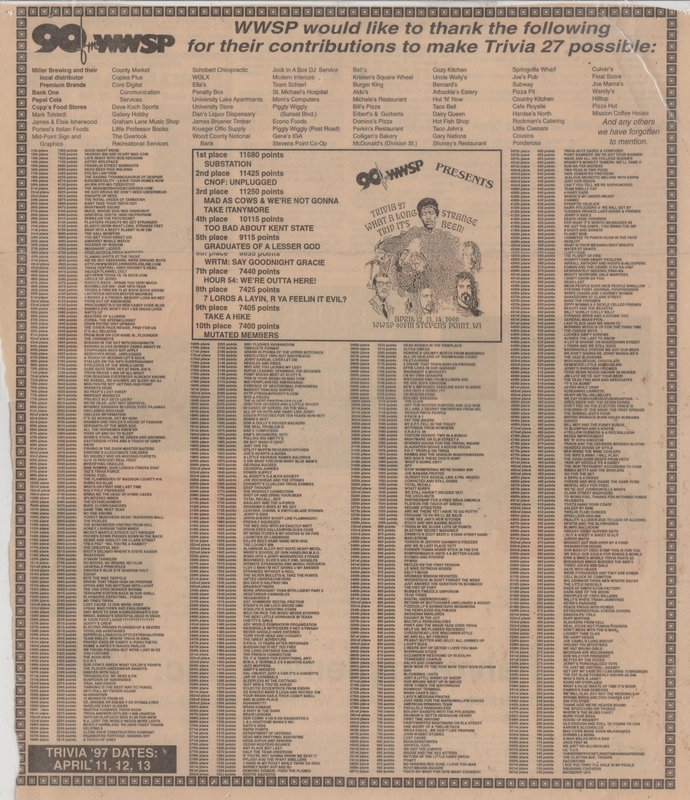 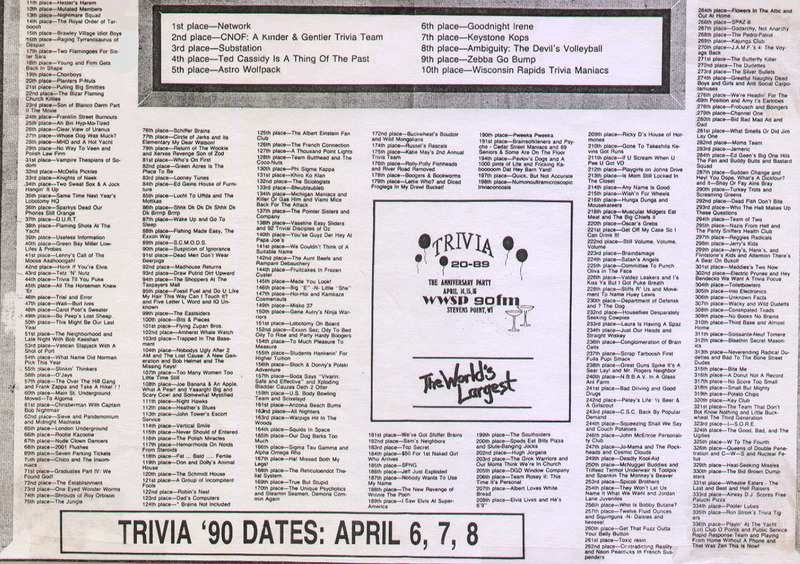 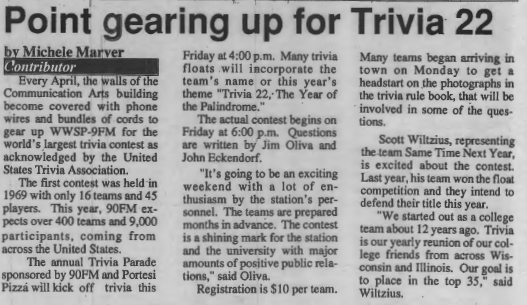 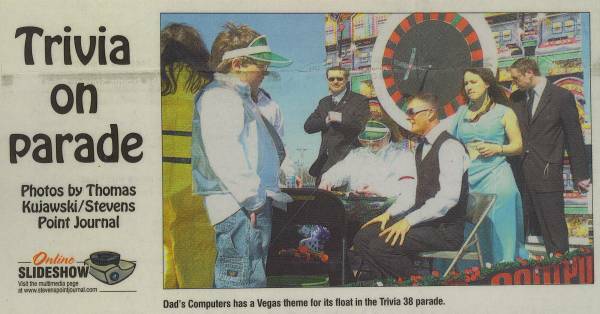 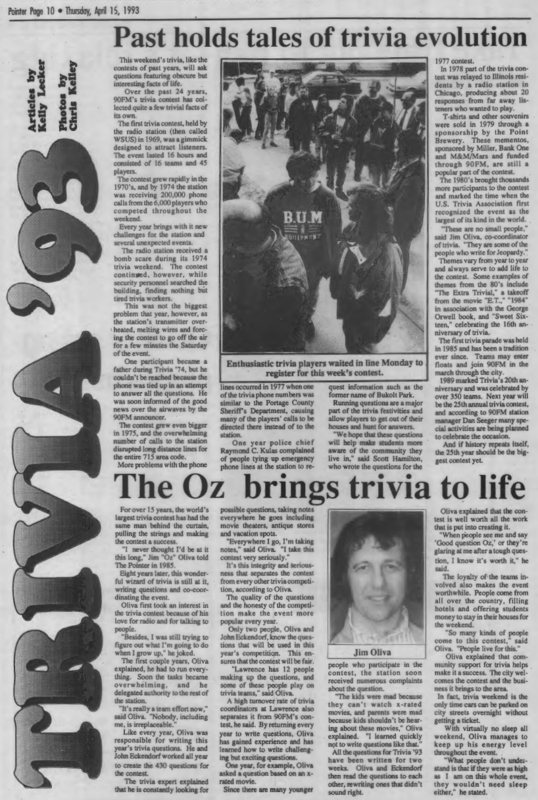 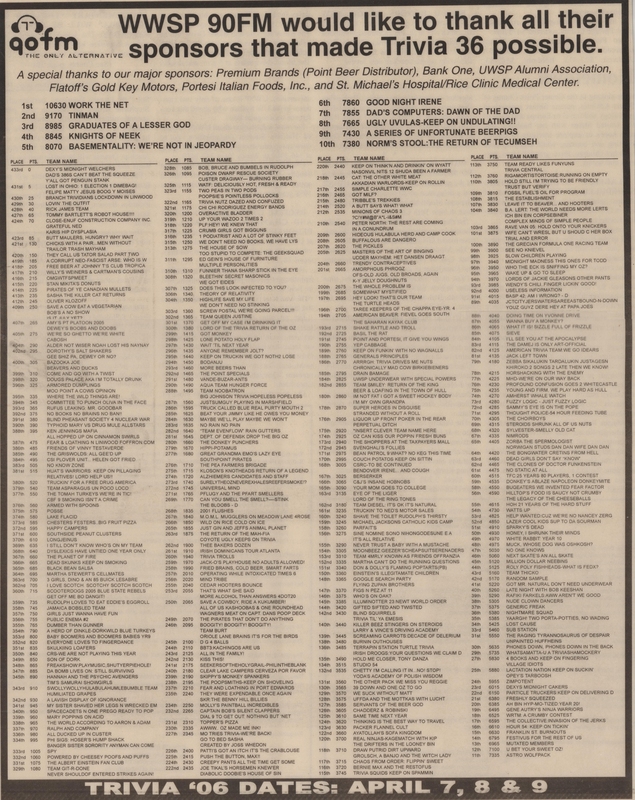 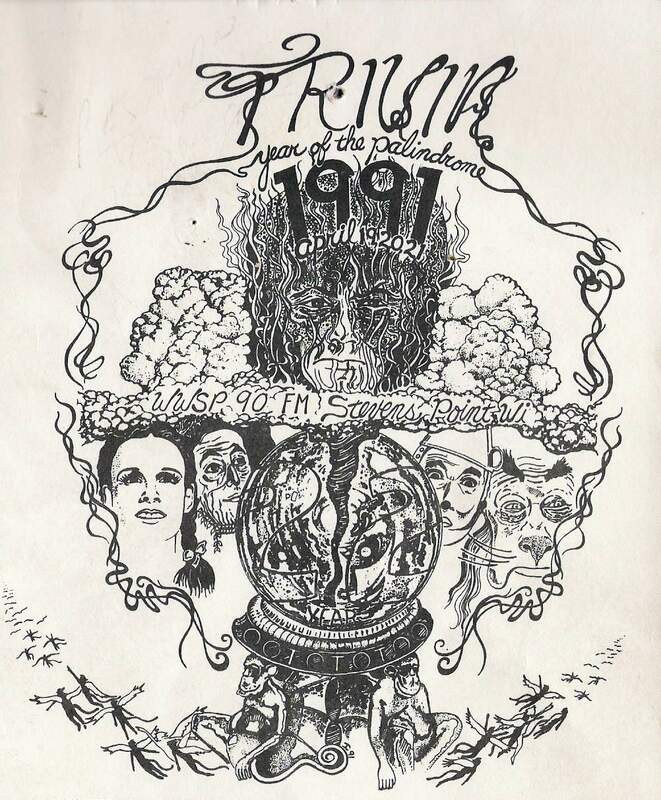 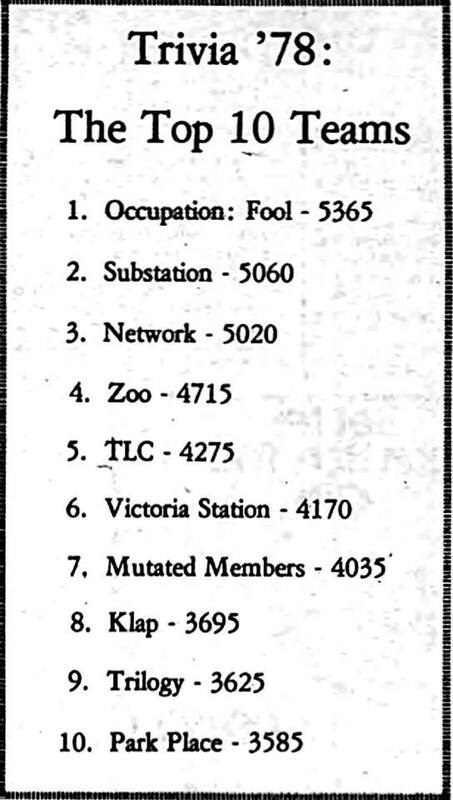 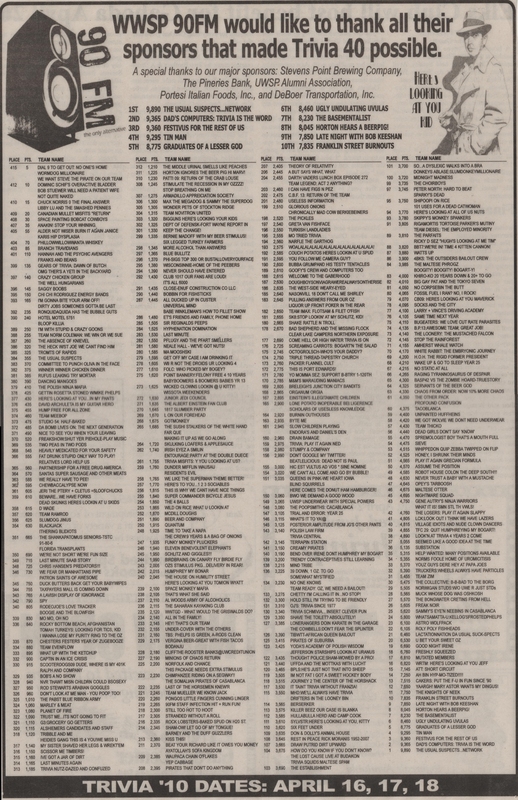 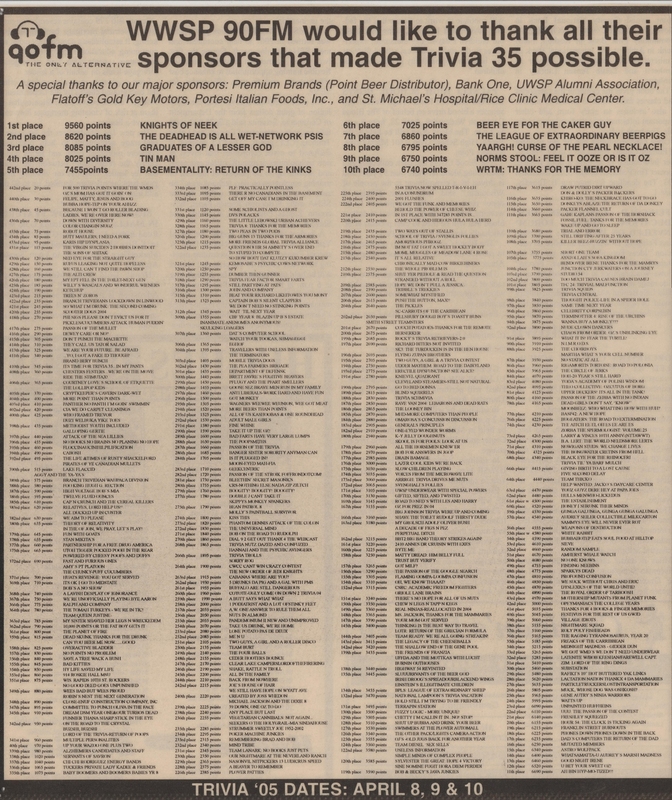 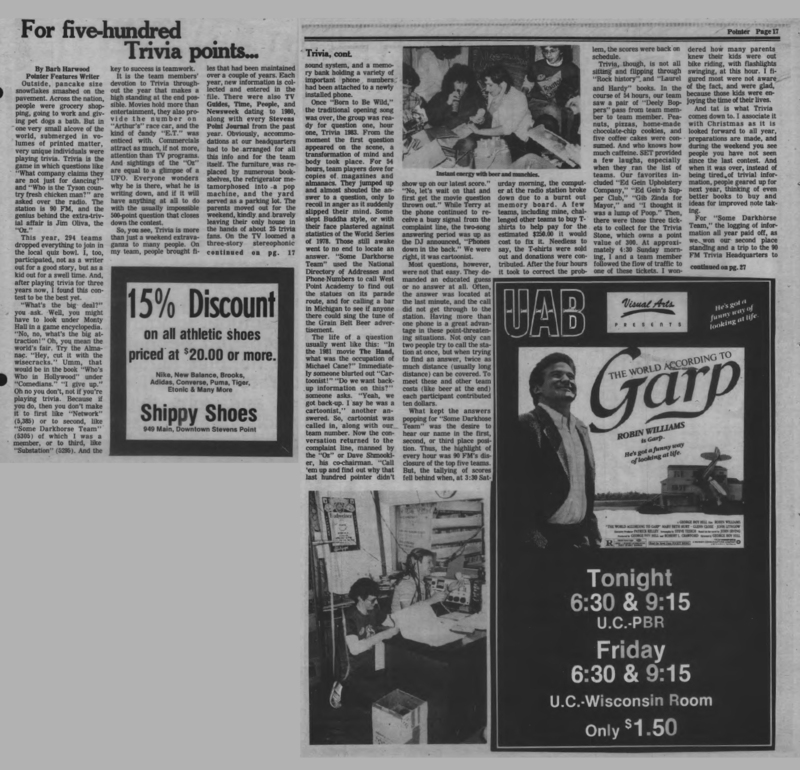 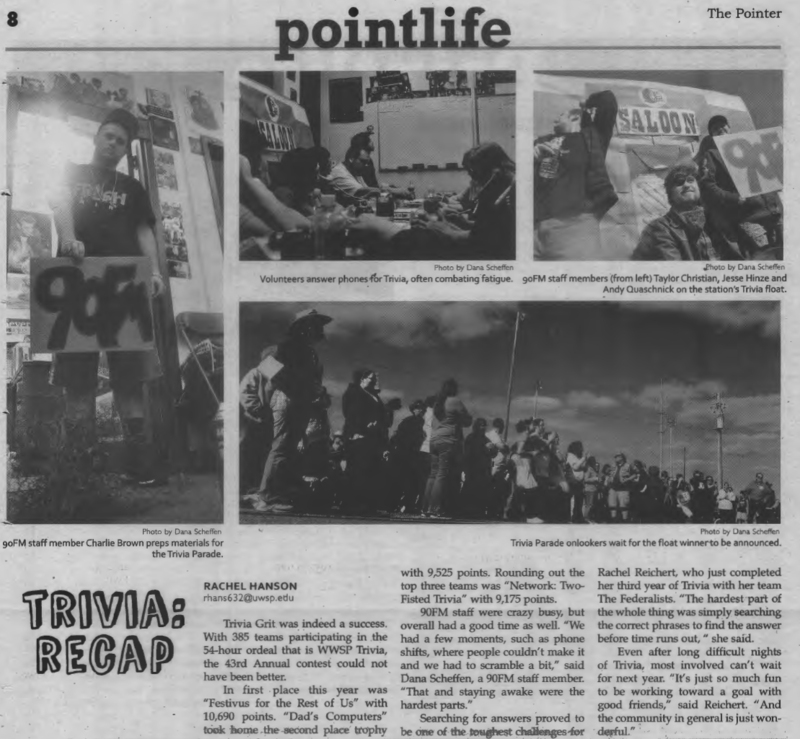 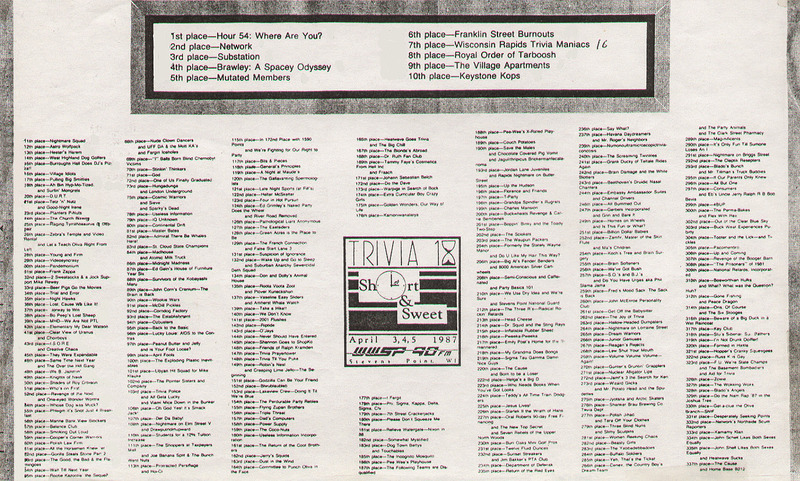 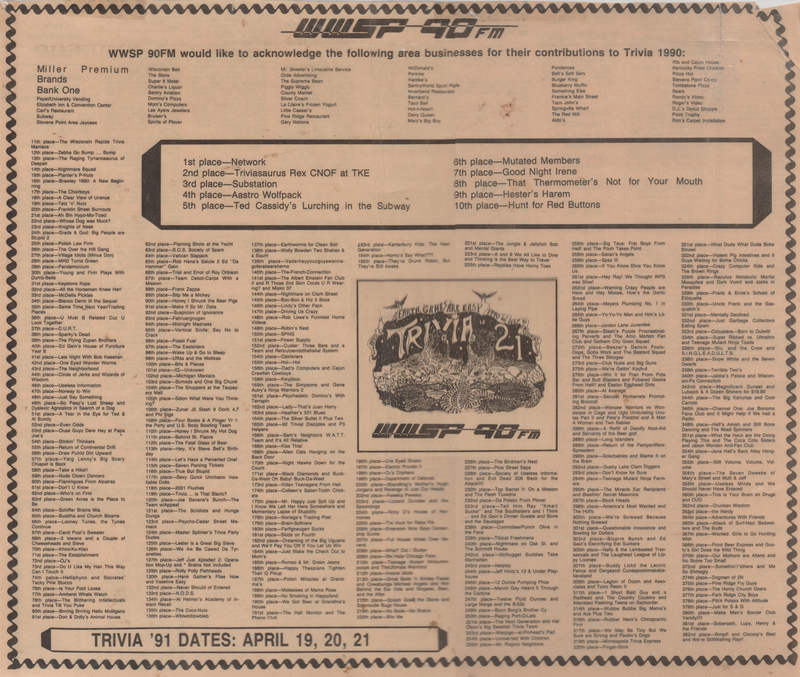 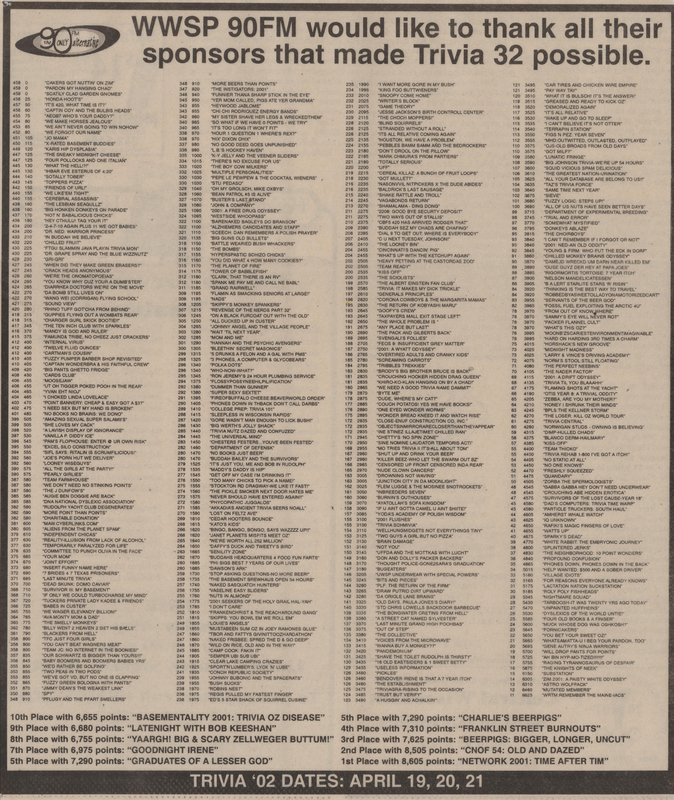 Pointer Newspaper - April 2, 1992 - "Welcome to the Land of Oz/Trivia Weekend Truth or Dare"
Pointer Newspaper - April 9, 1992 - "Trivia's Top 10 Teams"
Pointer Newspaper - April 18, 1991 - "Point Gearing Up For Trivia 22"
Pointer Newspaper - April 25, 1991 - "Volunteers At Trivia Answer Phones"
Pointer Newspaper - April 12, 1990 - "Trivia Contest Spans The Country"
. 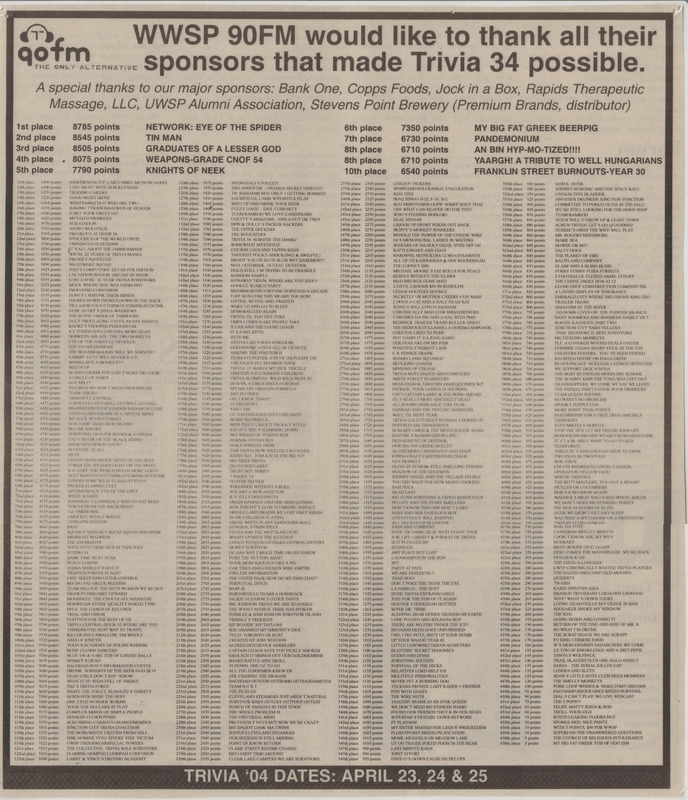 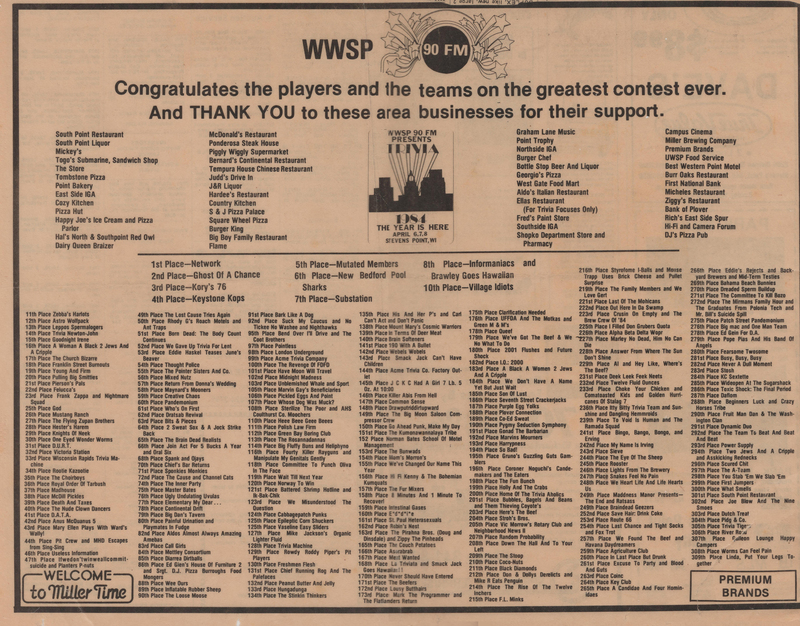 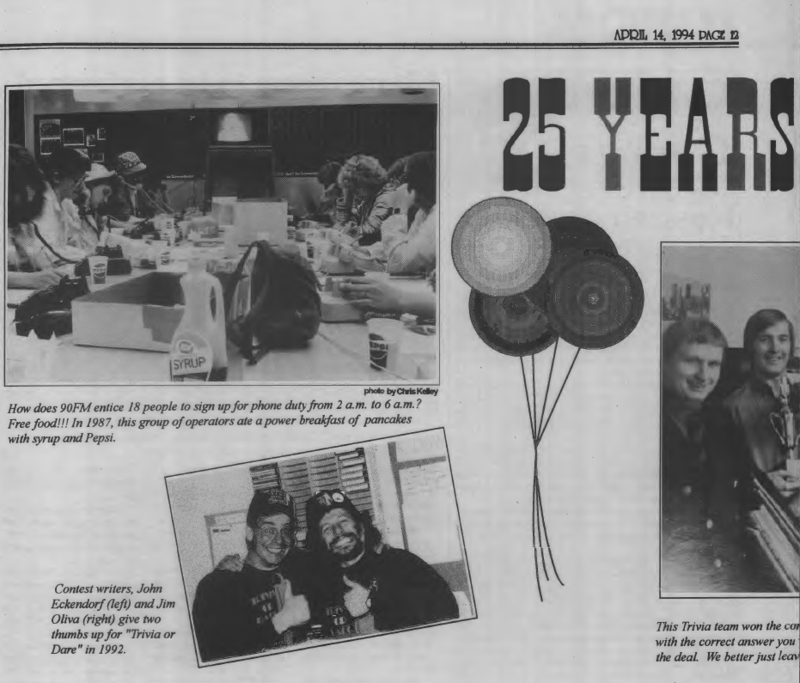 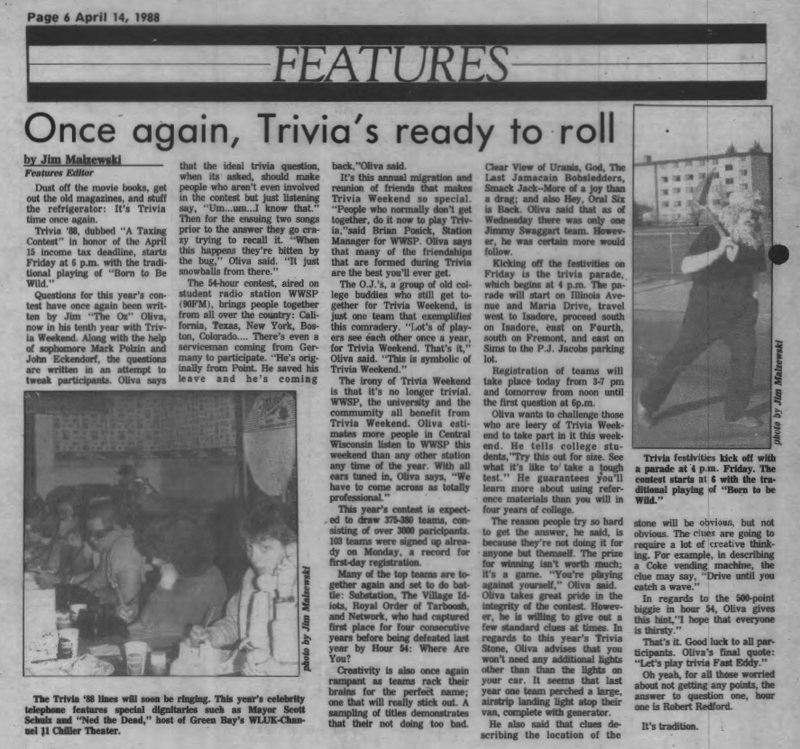 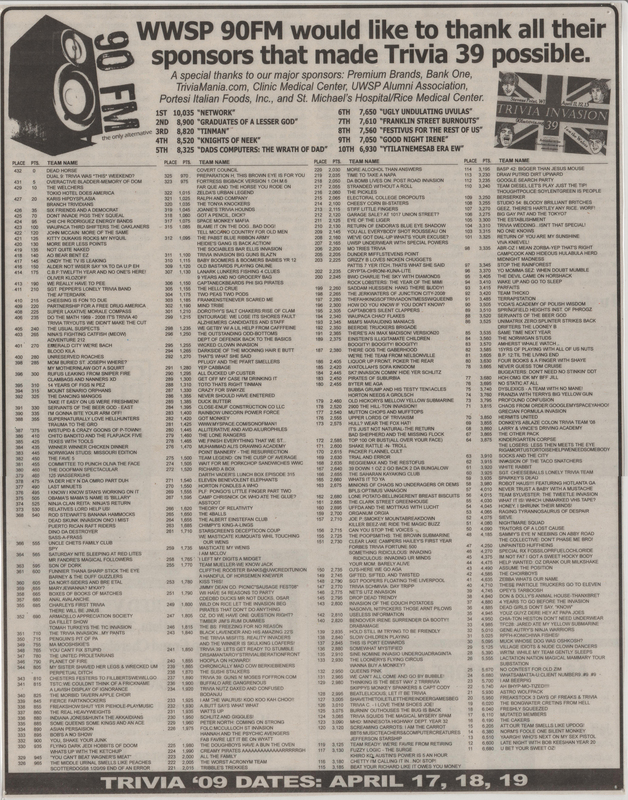 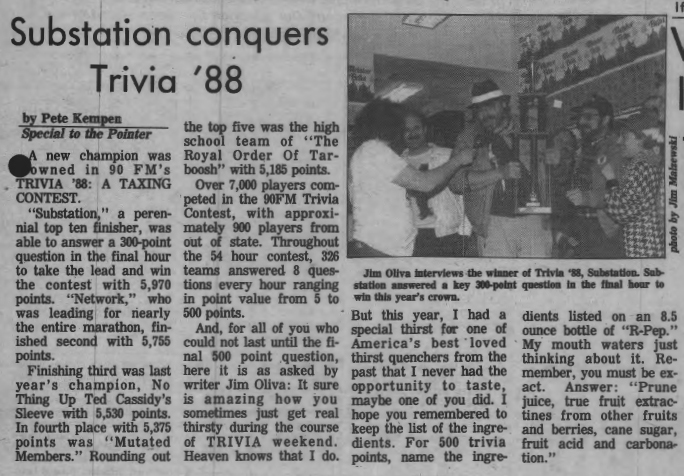 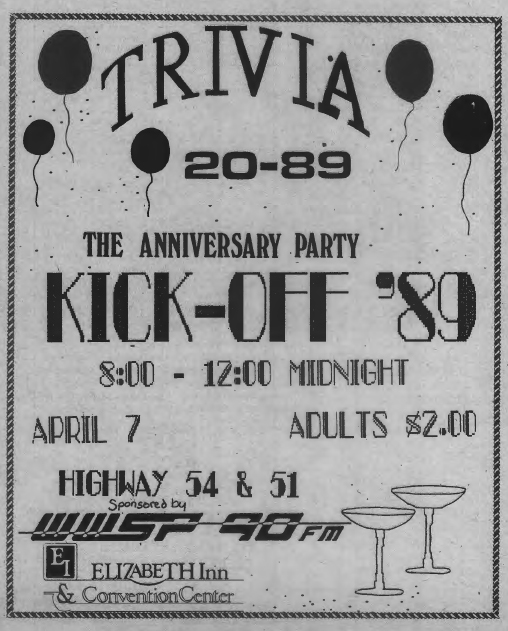 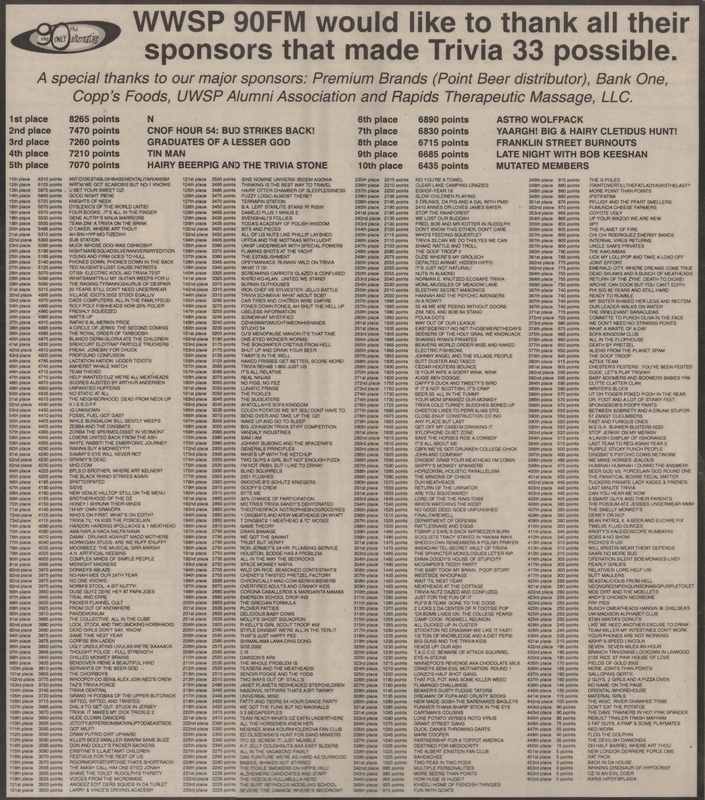 Pointer Newspaper - April 06, 1989 - "Trivia Kickoff Party (ad)"
Pointer Newspaper - April 13, 1989 - "1989-April-13-Front-Page"
Pointer Newspaper - April 13, 1989 - "It's Trivia Time"
Pointer Newspaper - April 20, 1989 - "Trivia 20 '89"
Pointer Newspaper - April 14, 1988 - "Once Again Trivia Is Ready To Roll"
Pointer Newspaper - April 21, 1988 - "Substation Conquers Trivia '88"
Pointer Newspaper - April 21, 1988 - "Substation Wins Trivia '88 / What Is Trivia Anyway?" 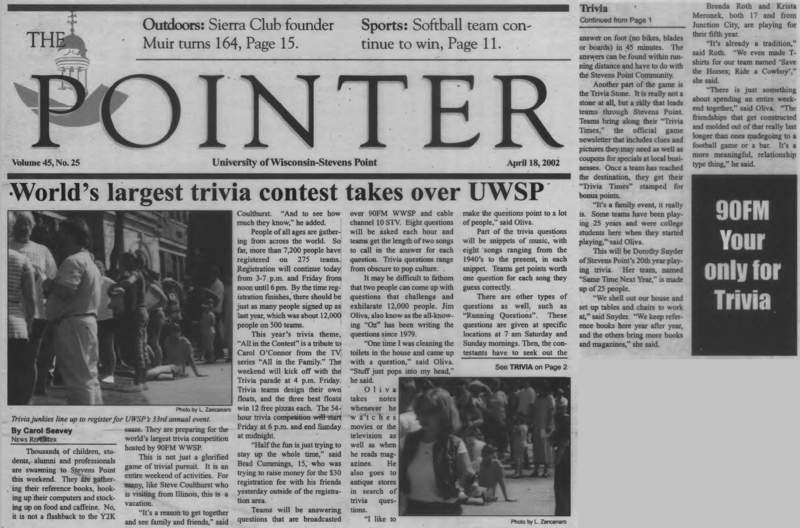 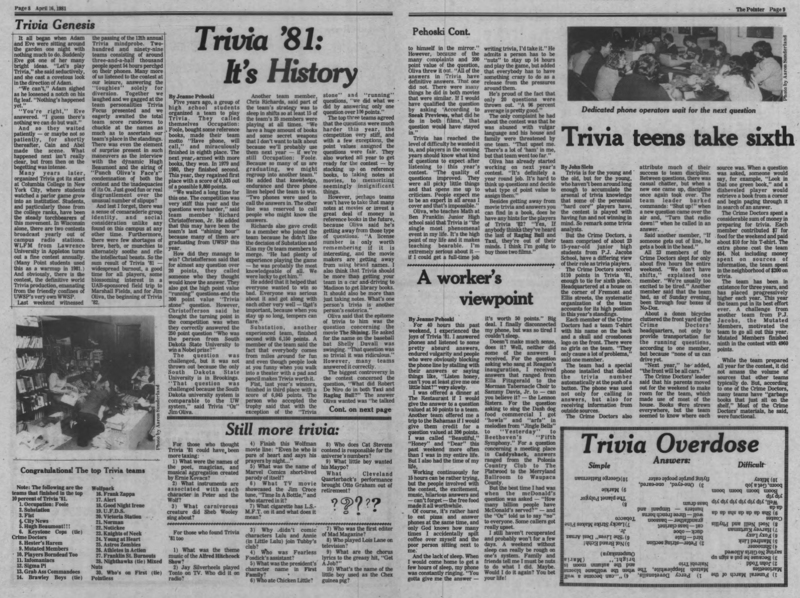 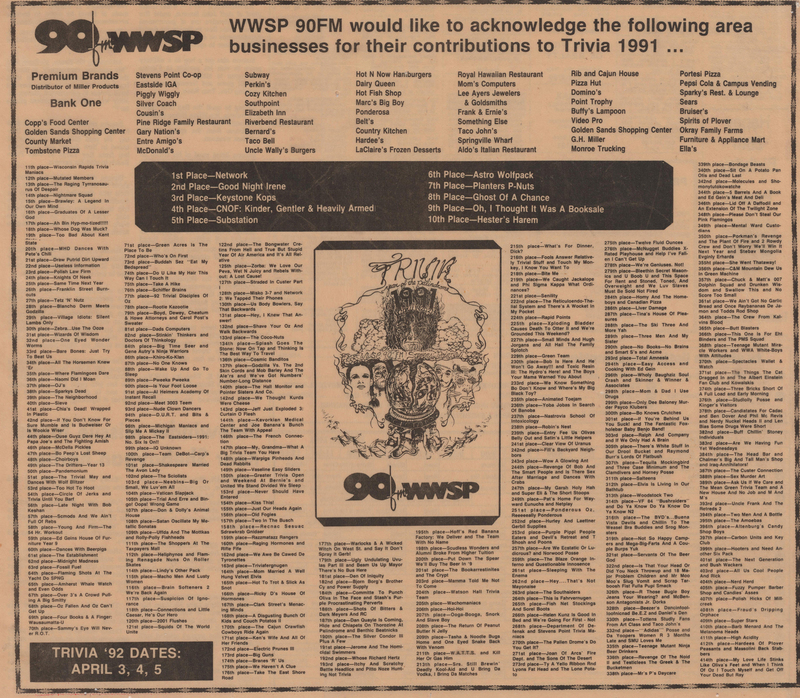 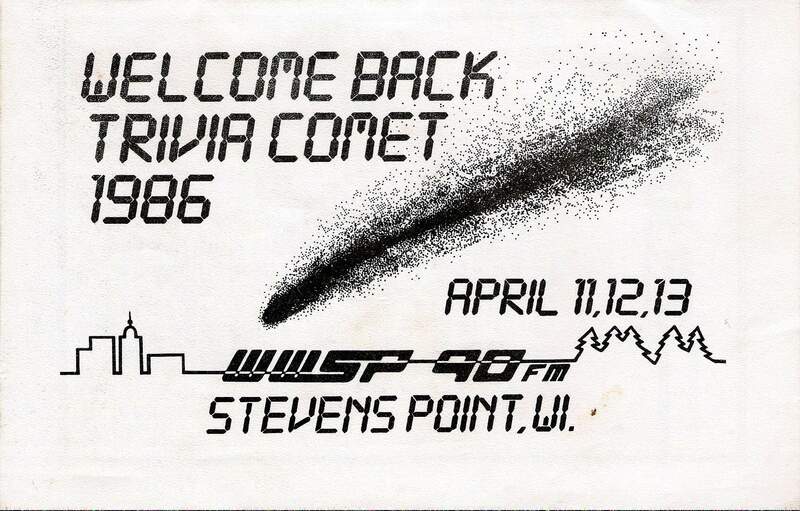 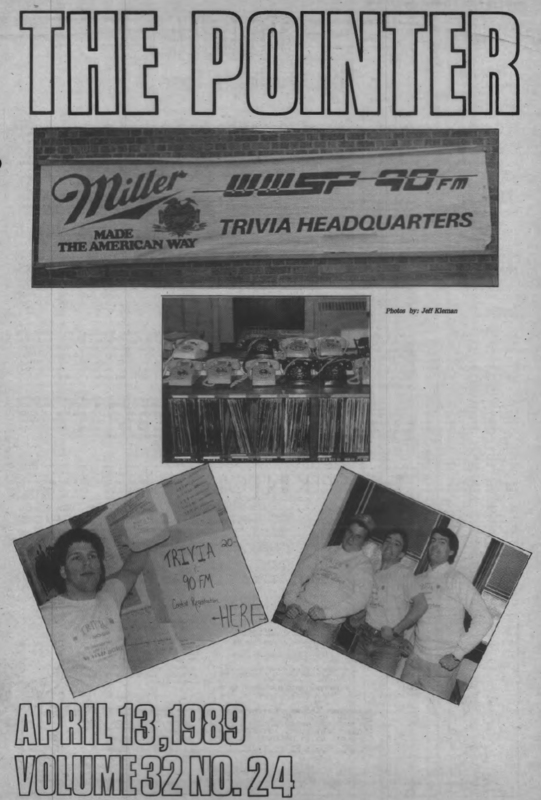 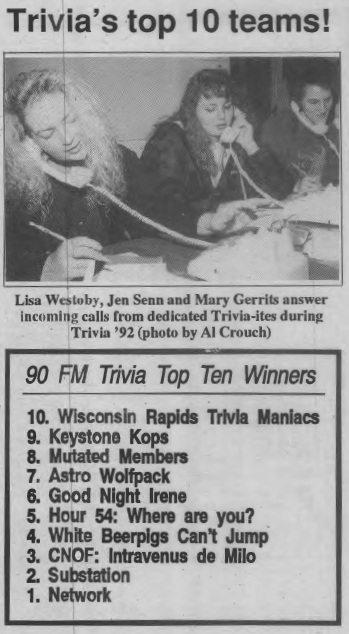 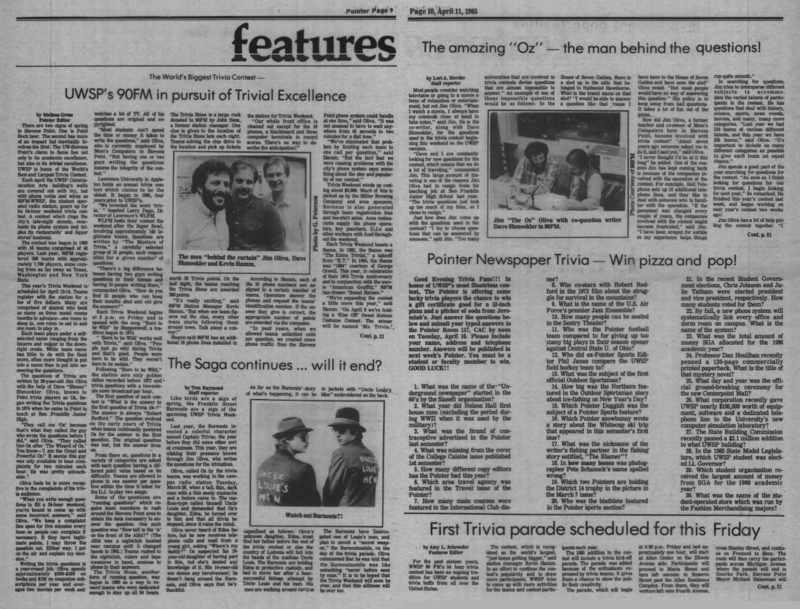 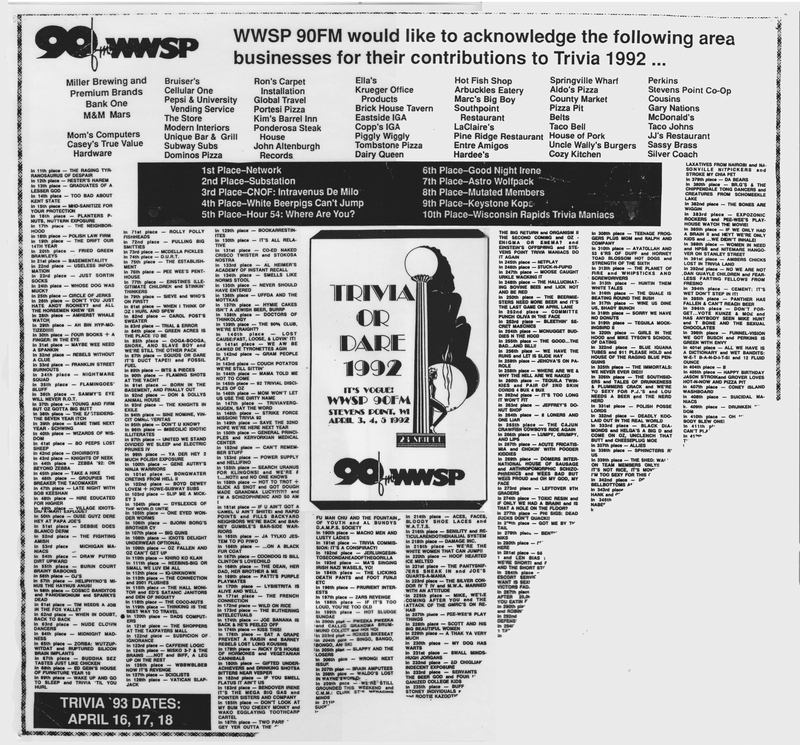 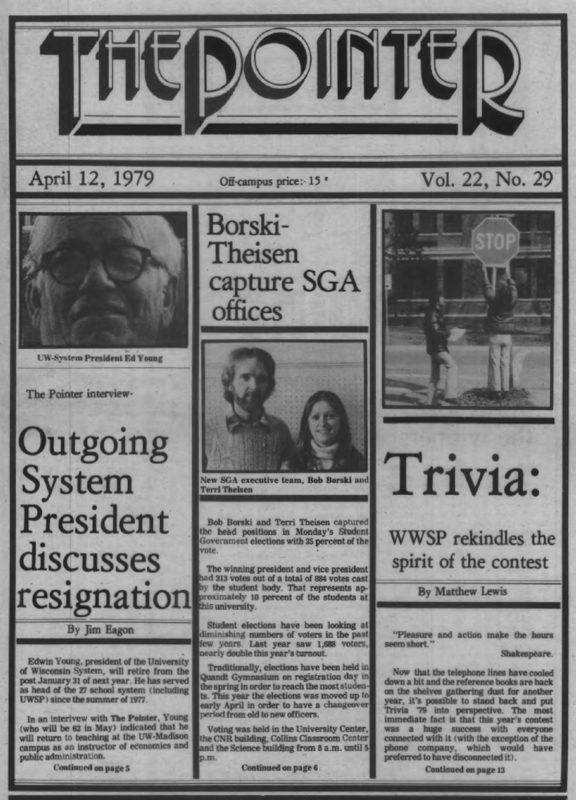 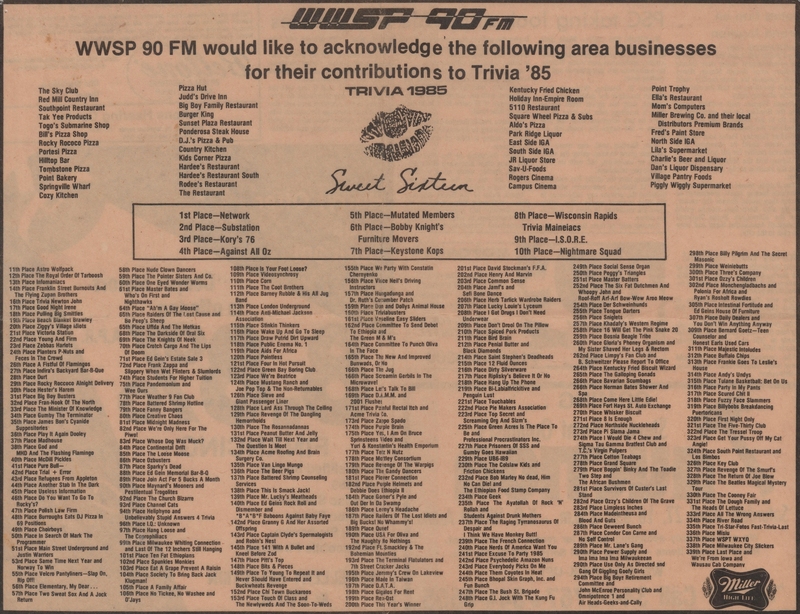 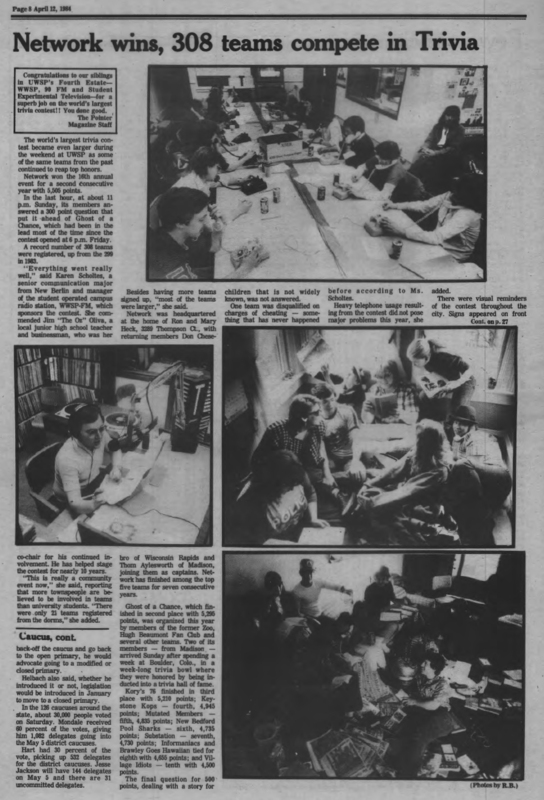 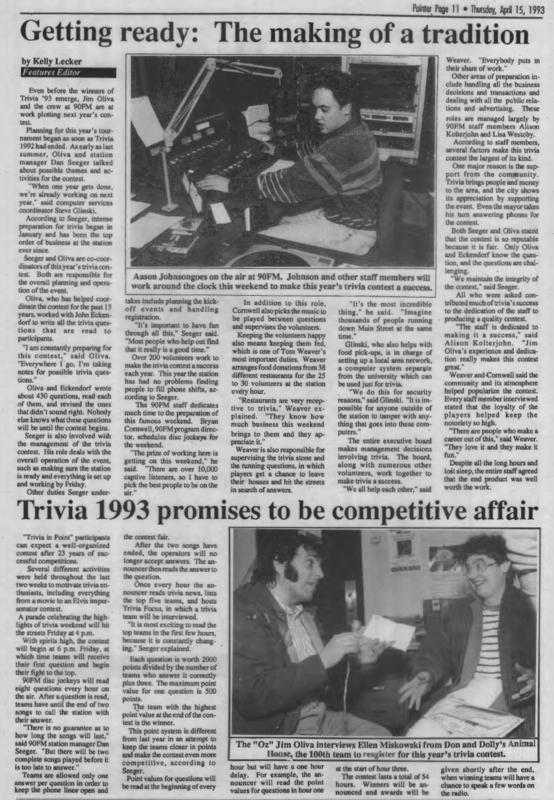 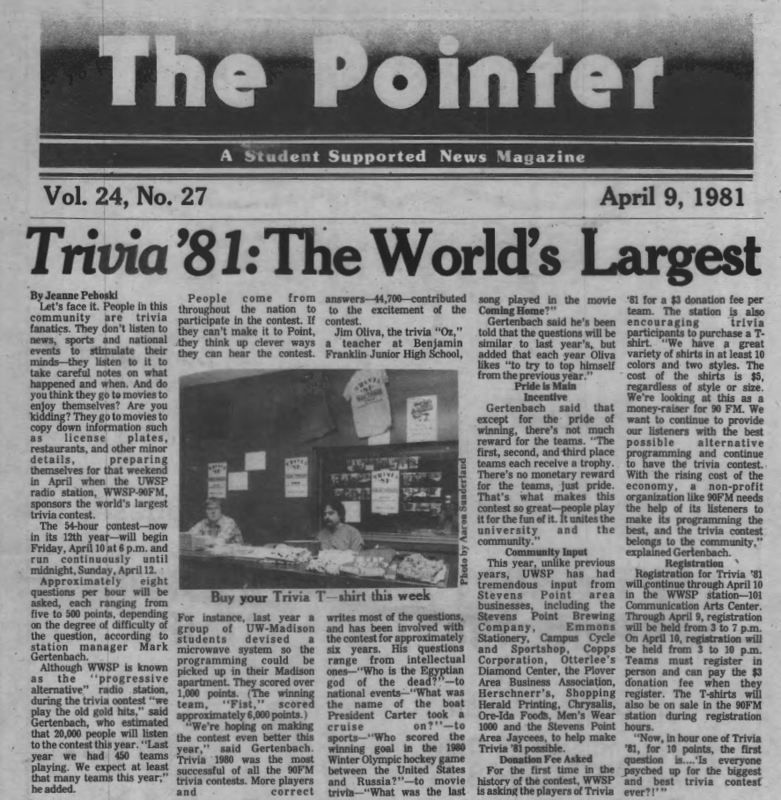 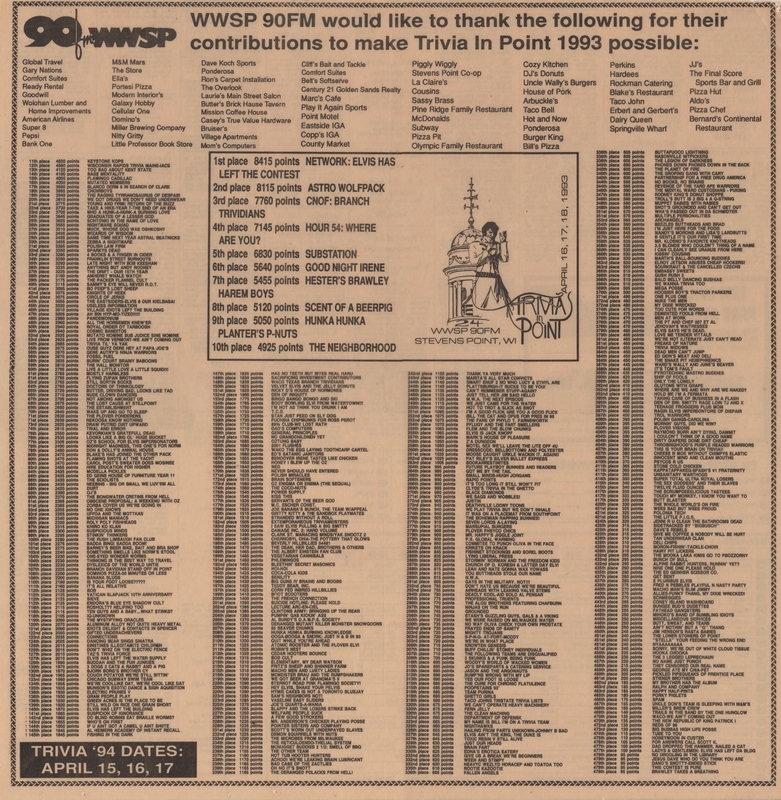 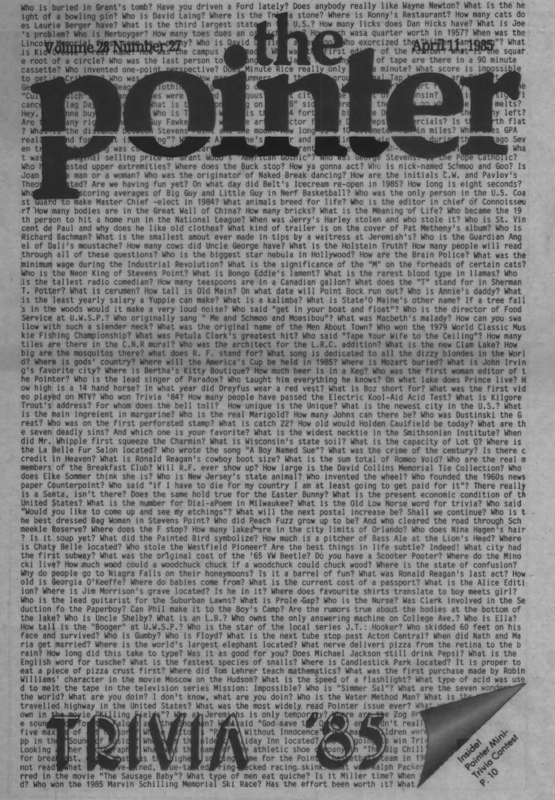 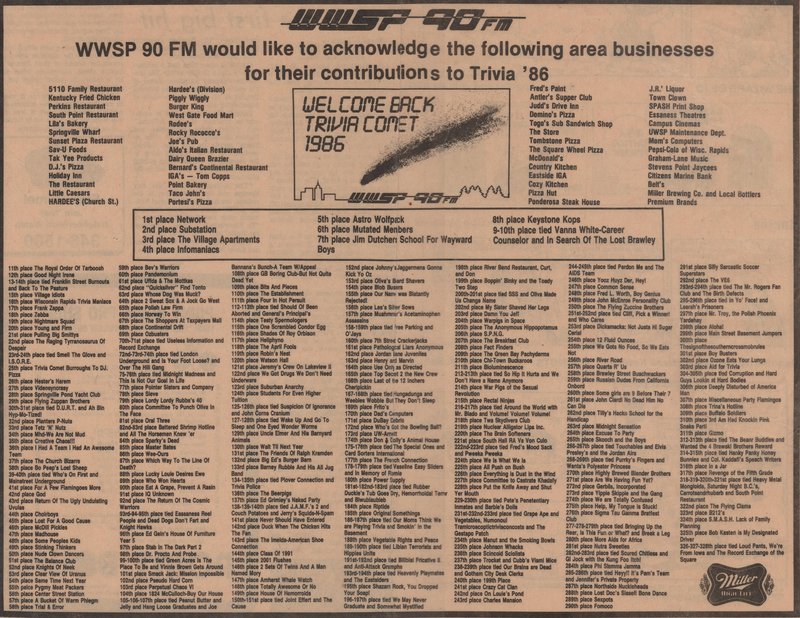 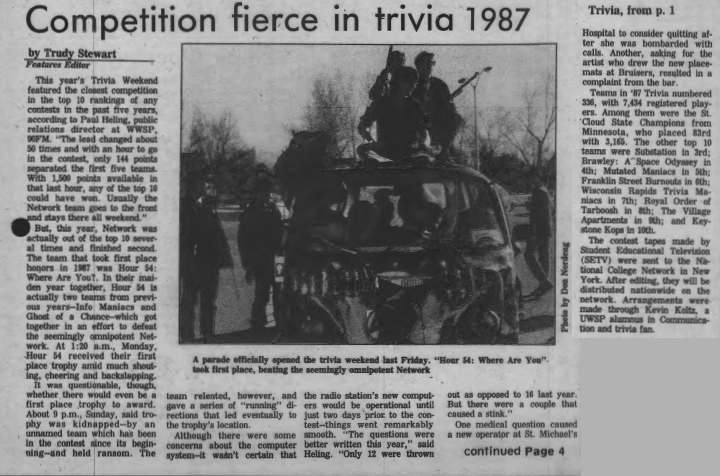 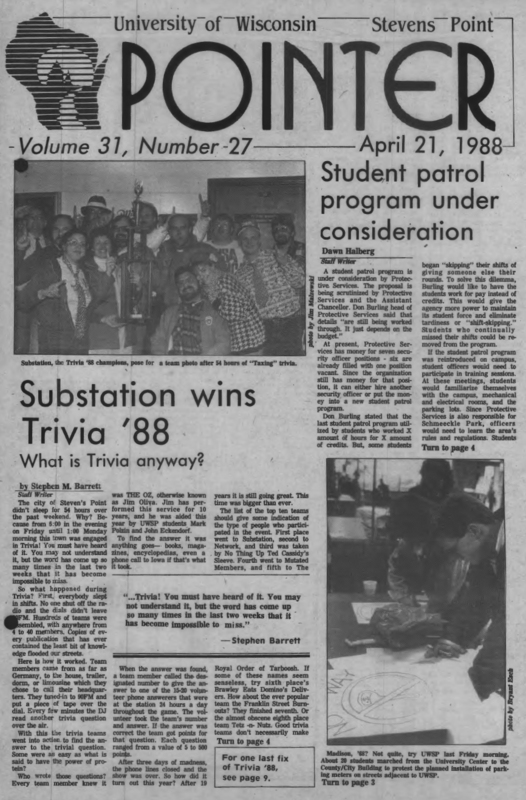 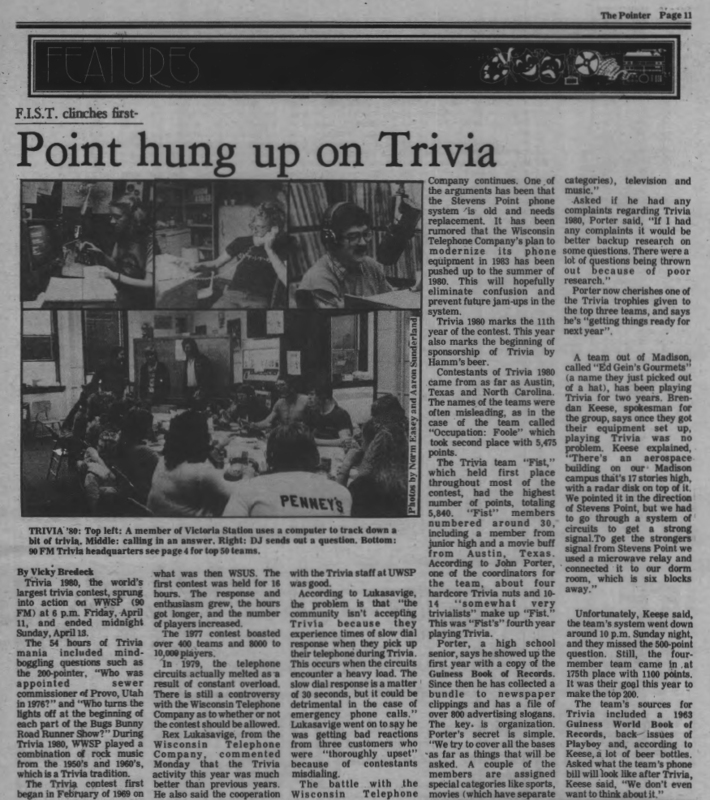 Pointer Newspaper - April 9, 1987 - "Competition Fierce in Trivia 1987"
Pointer Newspaper - April 17, 1986 - "Network Prevails"
Pointer Newspaper - April 11, 1985 - "Front Page"
Pointer Newspaper - April 11, 1985 - "UWSP 90FM In Pursuit of Trivia Excellence"
Pointer Newspaper - April 12, 1984 - "Network Wins / 308 Teams Compete In Trivia"
Pointer Newspaper - April 14, 1983 - "For Five Hundred Trivia Points"
Pointer Newspaper - April 1, 1982 - "Hugh Beaumont Trivia Victors"
Pointer Newspaper - April 9, 1981 - "Trivia 81 The World's Largest"
Pointer Newspaper - April 9, 1981 - "Trivia '81 It's History"
Pointer Newspaper - April 17, 1980 - "Point Hung Up On Trivia"
Pointer Newspaper - April 12, 1979 - "WWSP Rekindles Spirit of Trivia"
Pointer Newspaper - April 5, 1978 - "Esoterica 78 Beginning of an End?"